I hope you enjoyed my "Tutorial Blitz!" with new posts for you for the next few weeks; trying to find my footing & the direction of my blog! First of all, I want to share with you a Scripture that just seemed to speak to me, when I heard it. I was listening to Dr. David Jeremiah, I wrote it down quickly so I wouldn't forget it. I was actually thinking of our kids, but knew this Scripture was for me too! When I find a Scripture that speaks to me or that I think will encourage me, I write it out on a 6" x 4" card & then I decorate the card. Sometimes, I'll send them to our kids or I will post them about the house where I can see them. Sometimes they are decorated with stamps, other times I hand draw my designs. Today, I hand drew my design. 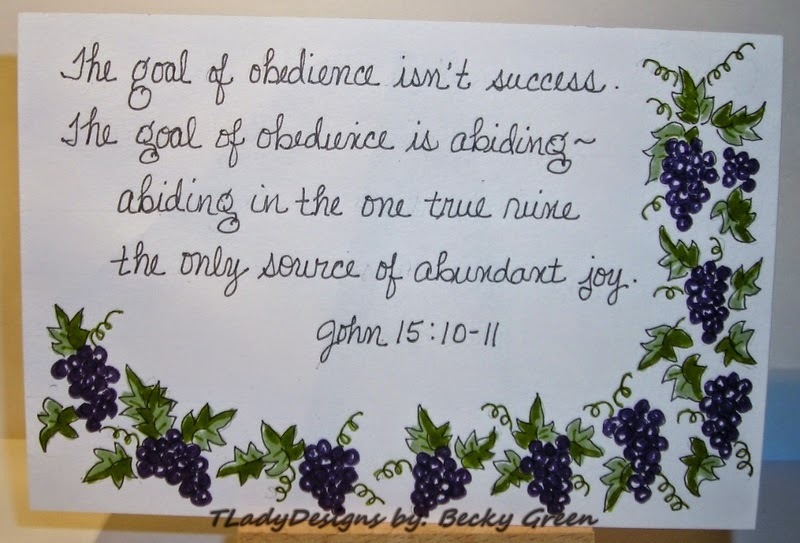 abiding in the one true vine, the only source of abundant joy." There are many times we don't succeed at obedience. I think of children, disobeying their parents....that's us sometimes as God's children. We disobey to get our way, to manipulate the situation, to force what we want. We disobey when God specifically tells us something through His Word, & rather than trust Him that it is so, we react to the situation around us. There are many situations that I can describe where we might disobey. We receive perfect joy of ample quantity for remaining stable, not fighting Christ & what He wants in our lives, for accepting without objection what Christ has for us! I also know, people make life harder than it needs to be. If we can only remember this promise! Now for my Artistic Creation for you today! I wanted to do a flower of some sort & this just came to me one evening as I closed my eyes. Once I was finished creating this, I remembered a book I had on Monet. 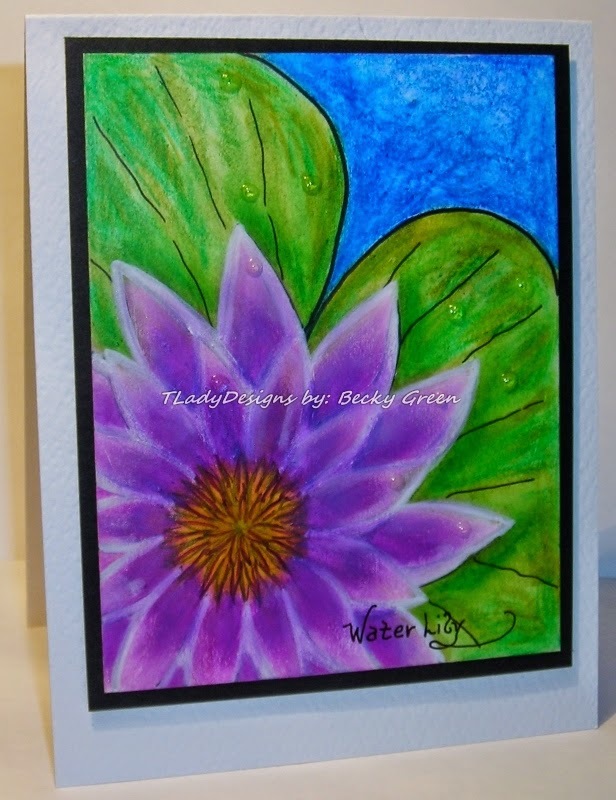 It made me think of Monet's Water Lily's! I sketched out my design first with my Faber-Castell 9000 Artist Graphite Pencils. Then I used my Faber-Castell Illustration Pens to draw over my pencil markings. Then using my Gelato's I colored in my image & just blended it with my fingers. I also used my Faber-Castell Artist Crayons to add additional depth to my colored image, and I also used my Faber Castell- White Pitt Pen 101***. 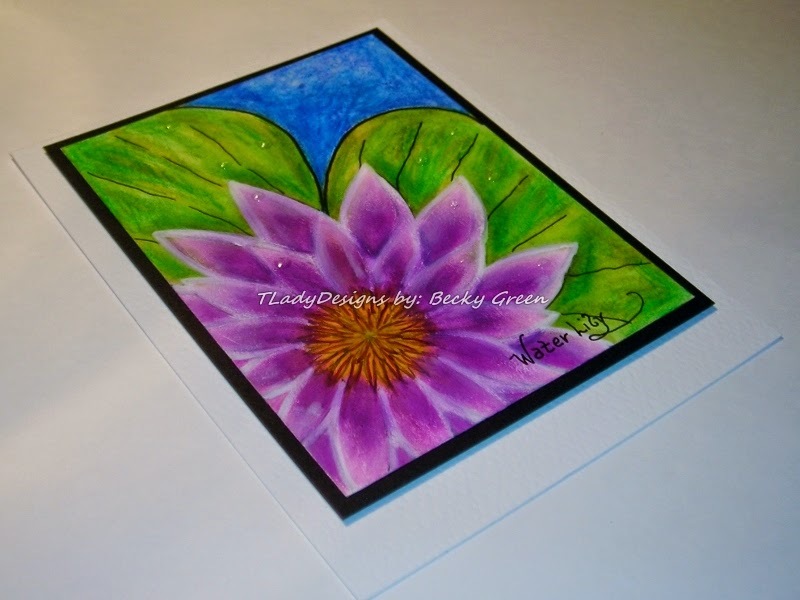 I wanted to write the name of my flower on my image & so I used my Faber-Castell Illustration Pens. Faber Castell Illustration Pens are India Ink, so they work well with the Gelatos. 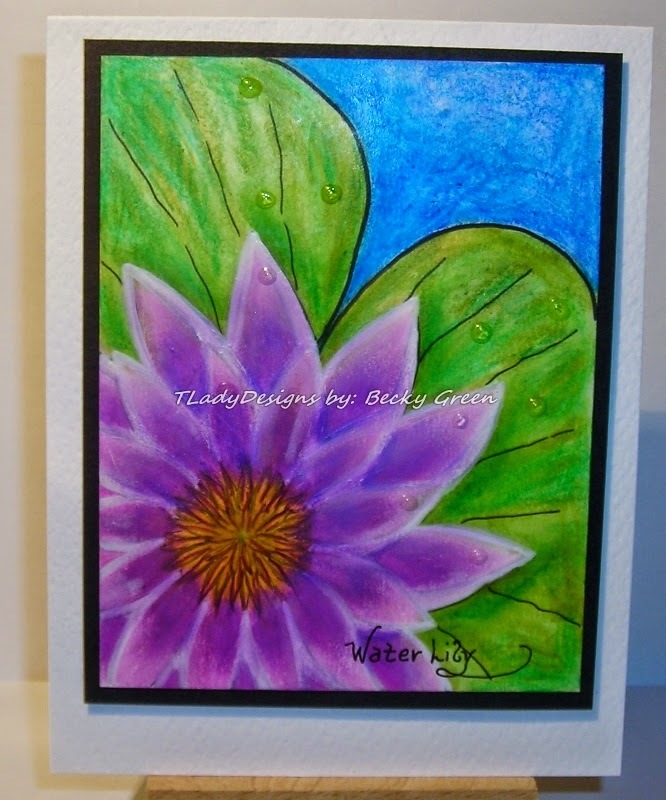 Lastly, I added Diamond Glaze for water droplets on the flower & the lily pad. This image just screamed CAS to me! Don't forget to come back next week for a hand-drawn sketch I've done for you--"Sparkle!" Hope you like my "Monet!" P.S. I think I need some Mozart & a fine cup of Tea now! Banana, Lavender, Raspberry, White, Pistachio & Green Tea. 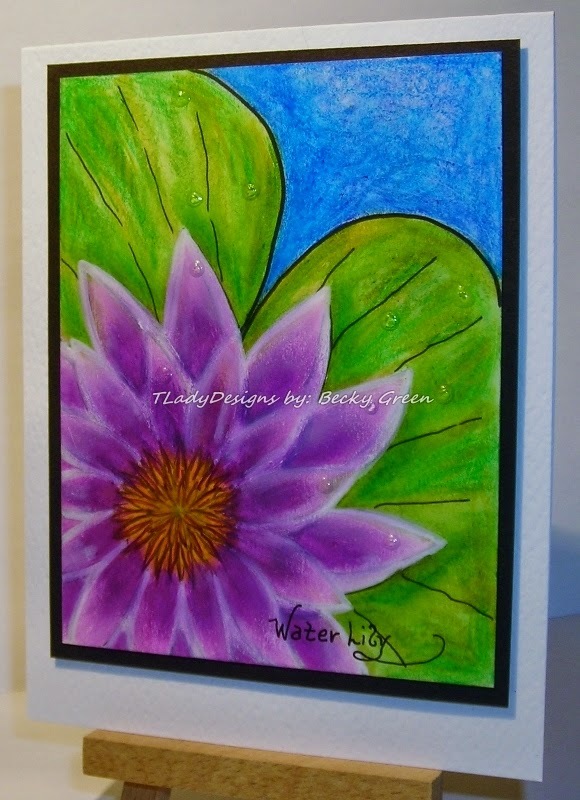 Prisma Color Marker- For the fine lines on the flower center. TUTORIAL BLITZ------Behind the Scenes- #3! 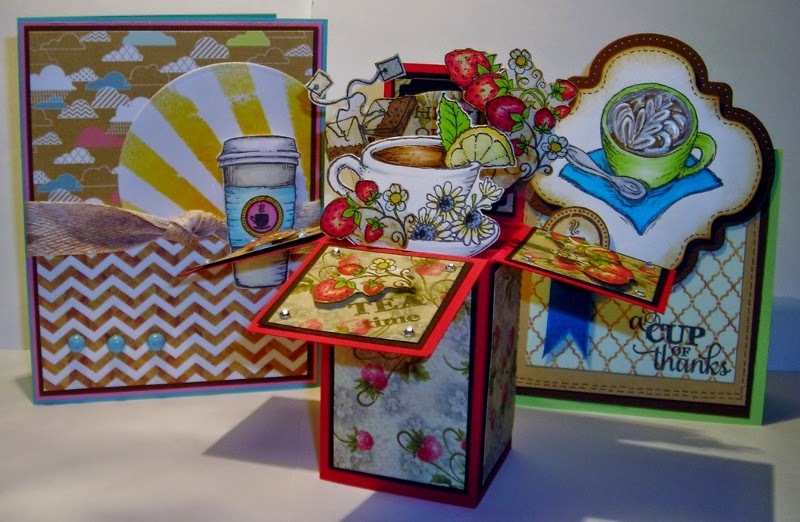 I'm here today with the last tutorial of my "Tutorial Blitz," just for you! This one is a little simpler & I hope you like it too. 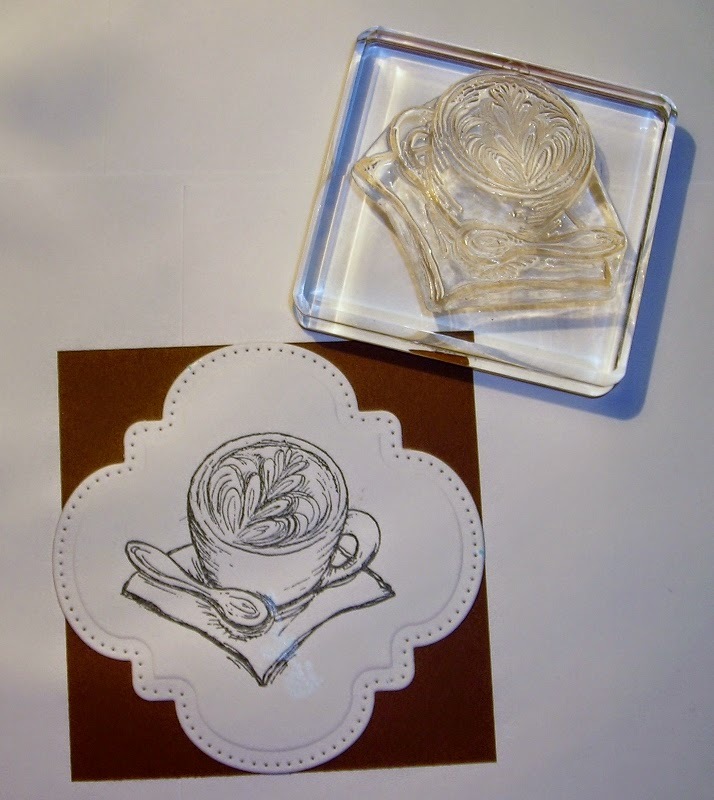 Giving you some more ideas for your coffee stamps. 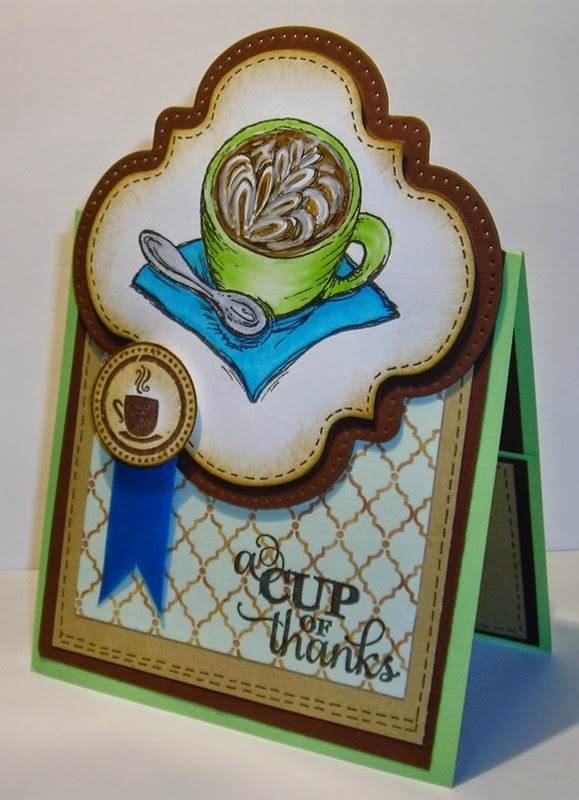 Remember all these images can be found anywhere out there in the stamping market. (SU is a good source for this image, maybe SSS -Simon Says Stamp)! 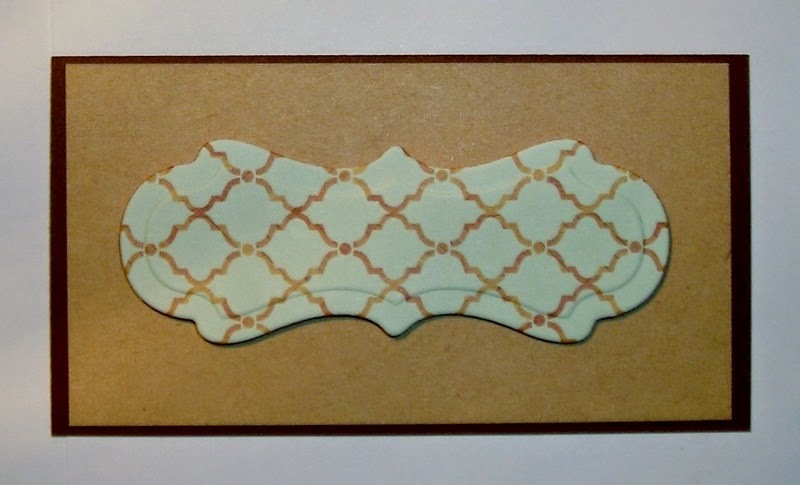 1- 8 1/2" x 5 1/2" - Aqua- This is your card base. 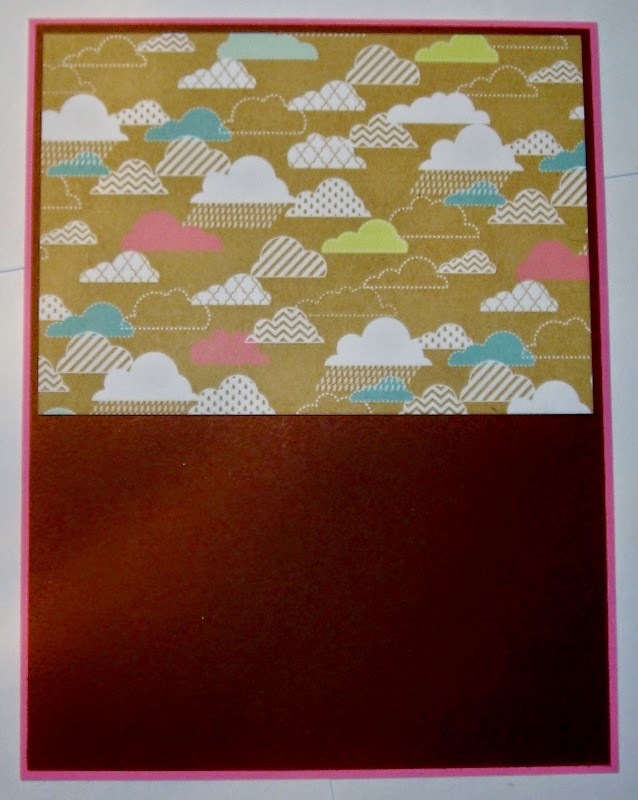 1- 4 1/8" x 5 3/8" - Pink- This layers on top of the card base. 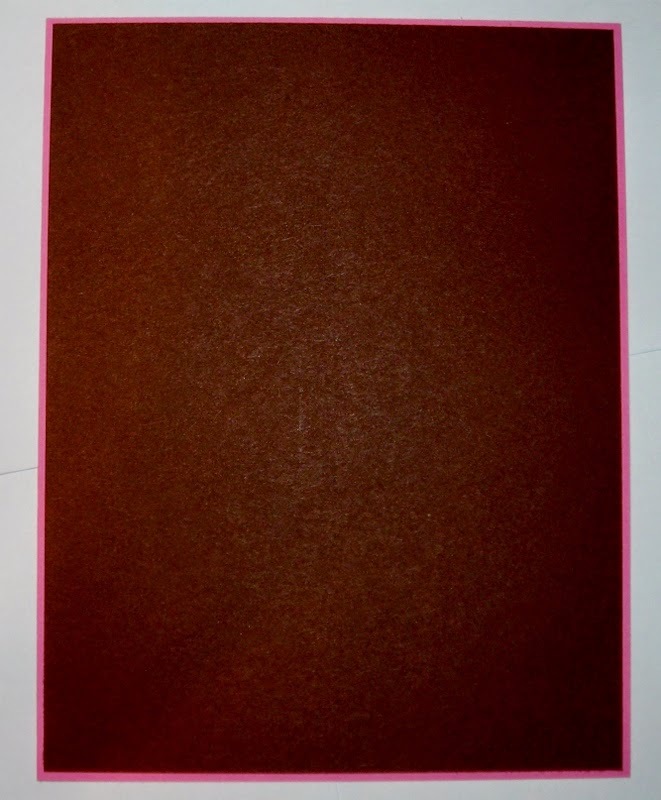 1- 4" x 5 1/4"- Dark Brown- This layers on top of the pink card stock. 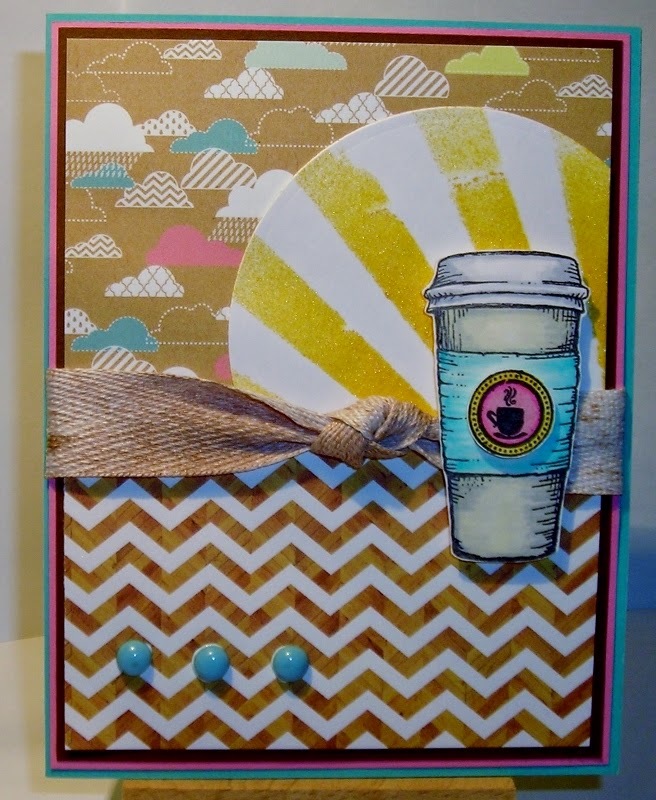 Designer Paper- Echo Park- "Everyday eclectic." 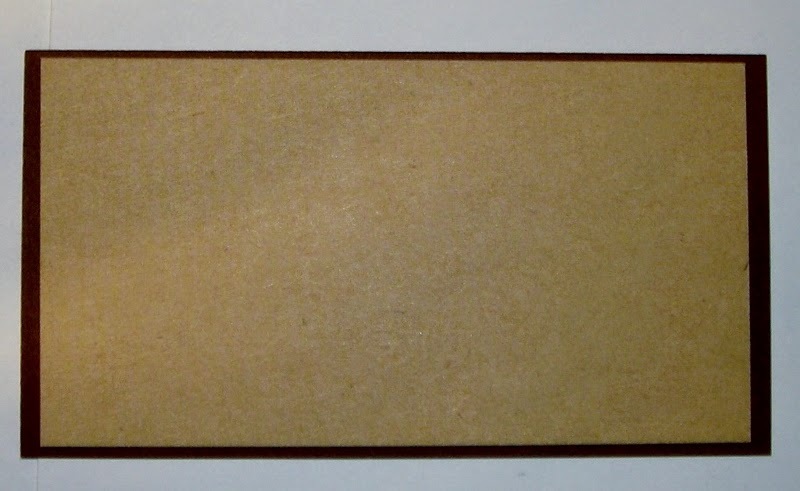 1- 2 3/4" x 3"- White- This is for your Stamped images. 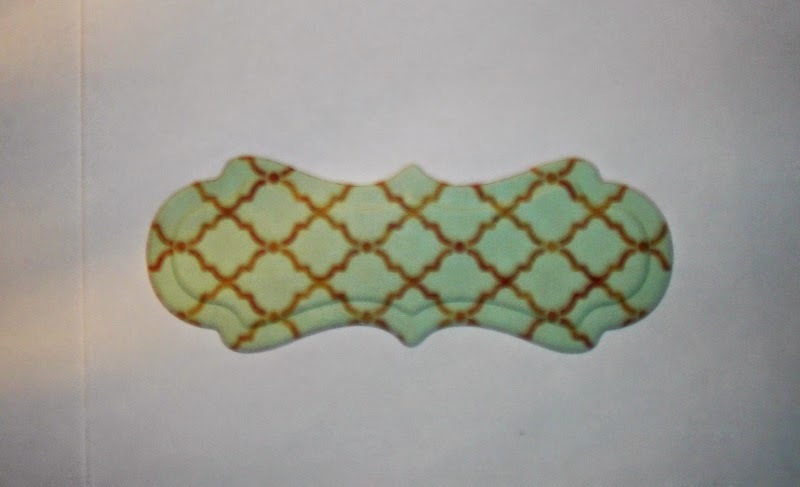 3- Aqua Enamel Dots-you can buy these or make your own like I did. Glimmer Mist for the ribbon-In Creme de Chocolate/ Dark Brown or Instant Coffee, hot water & spritz bottle. Your choice of coloring medium for the images. score at 4 1/4". Go ahead & fold your card & set this aside. First of all prepare the space where you will be spritzing with old newspaper or scrap paper to protect your surface. 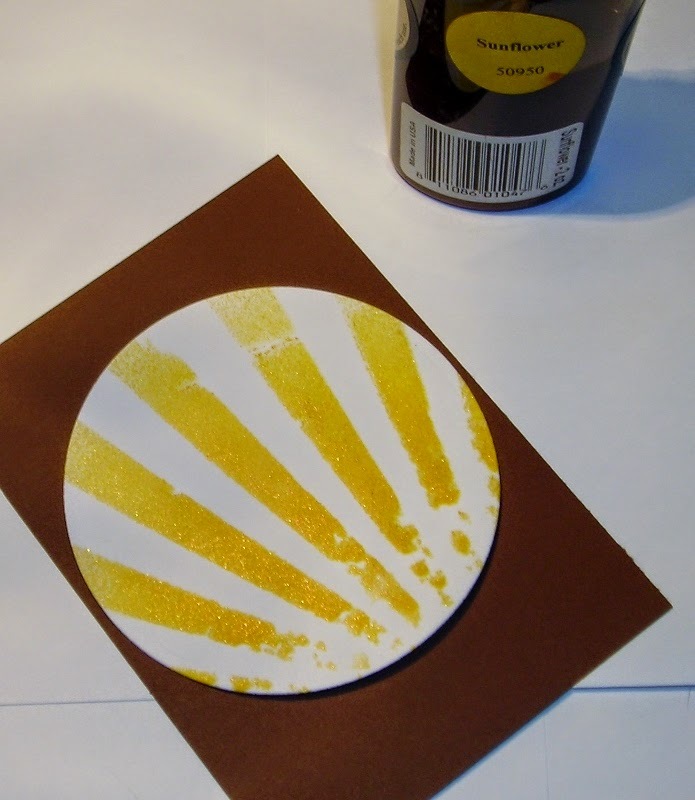 Using the Circle Die, lay your stencil over it, placing the rays coming off of one side as below. 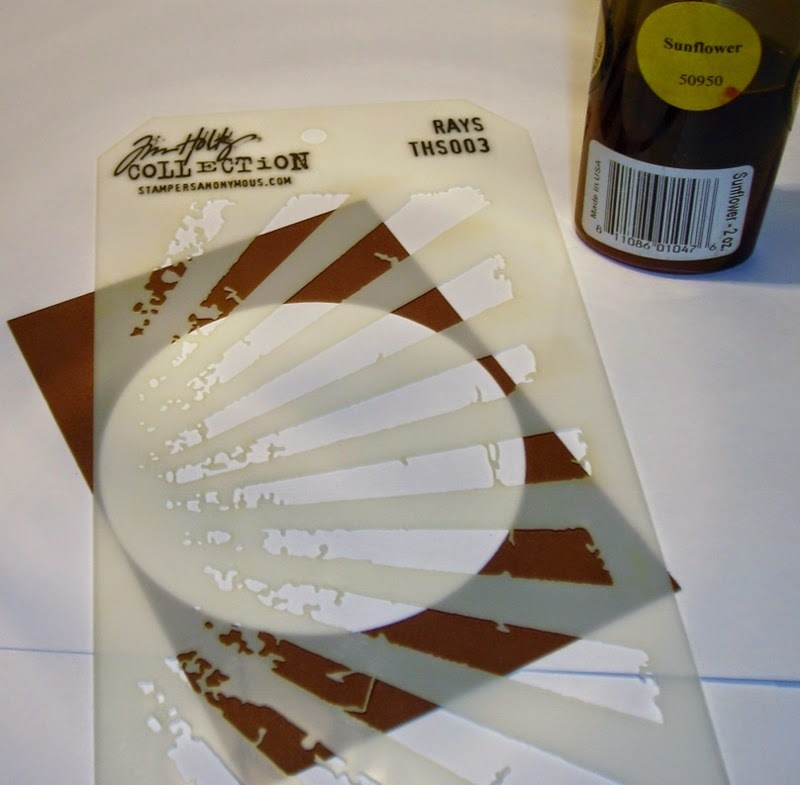 You can either spritz this or sponge on your color with a stencil, or use melted wax & let it drip to make the sun rays, or paper piece the sun rays instead of using the stencil. You choose. I chose to spritz it. I thought the sponging wasn't dark enough for me, & I like the shimmer of the Glimmer Mist! 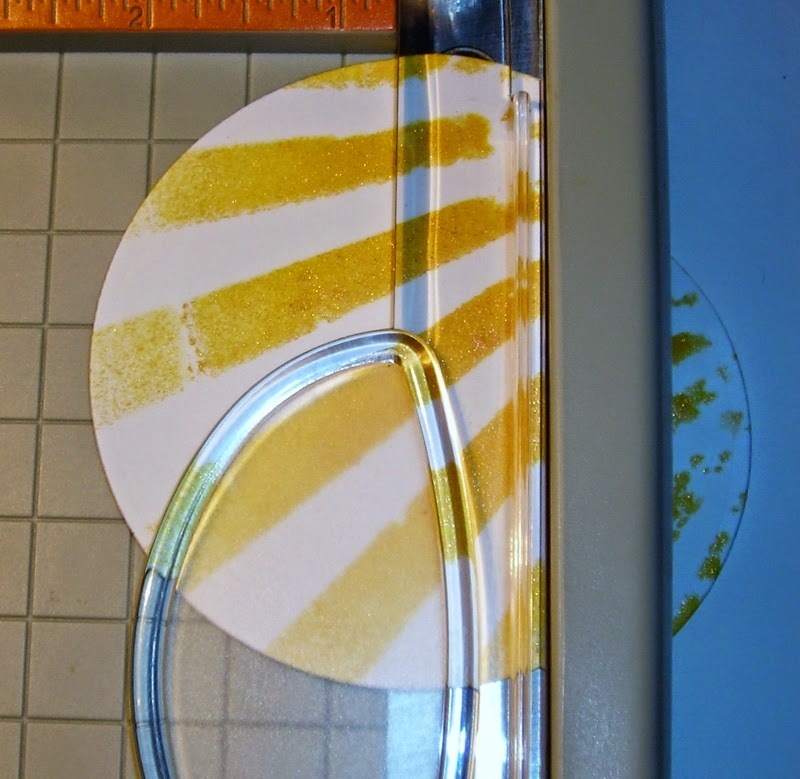 Be sure to clean your stencil as this dries. TIP: Keeping your tools clean makes them last longer & you won't end up with surprises later! This is after Spritzing. I love that shimmer! Lay it aside to dry. 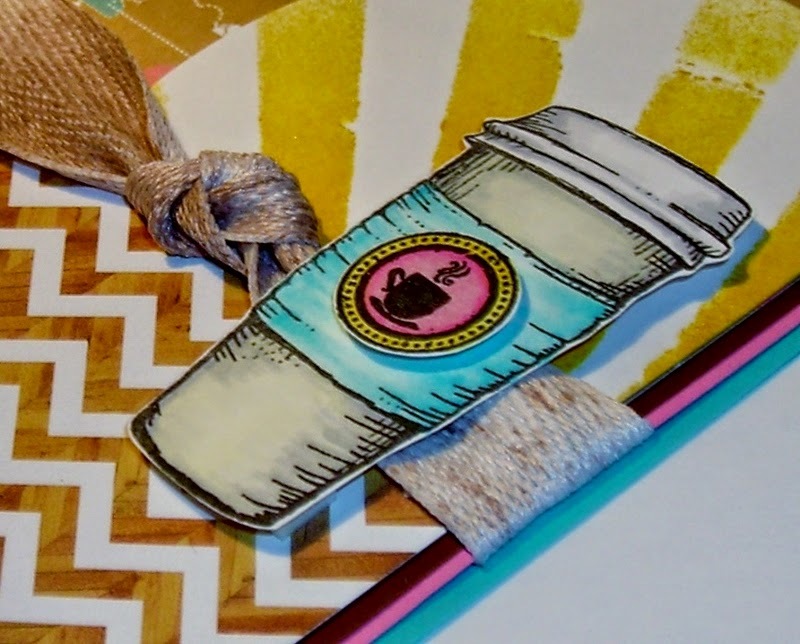 Prepare your space for spritzing your ribbon. Lay your ribbon down & spritz! Don't feel you have to soak the ribbon. Just enough to make it look like you've splattered some coffee on it. I used Glimmer Mist Creme De Chocolate- 30120. 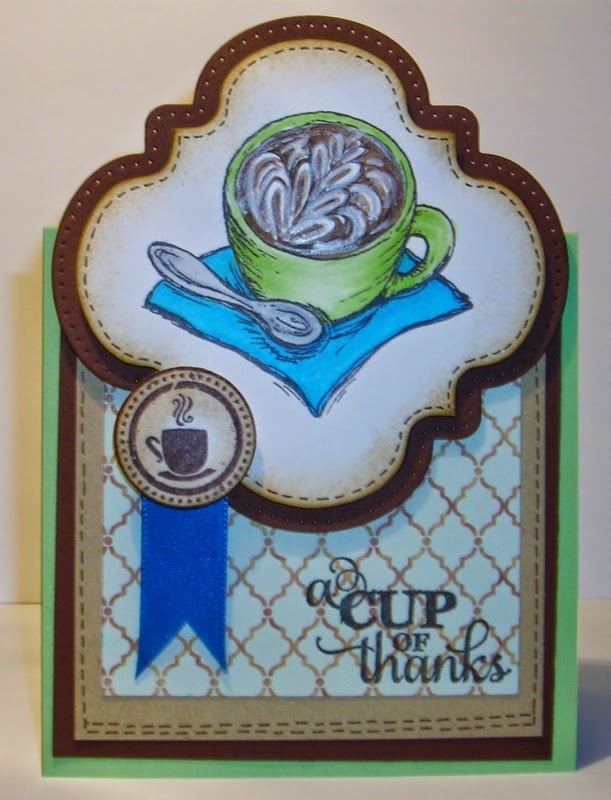 You can use Instant Coffee dissolved in hot water if you don't have Glimmer Mist. It leaves a nice coffee scent too! Set aside to dry. 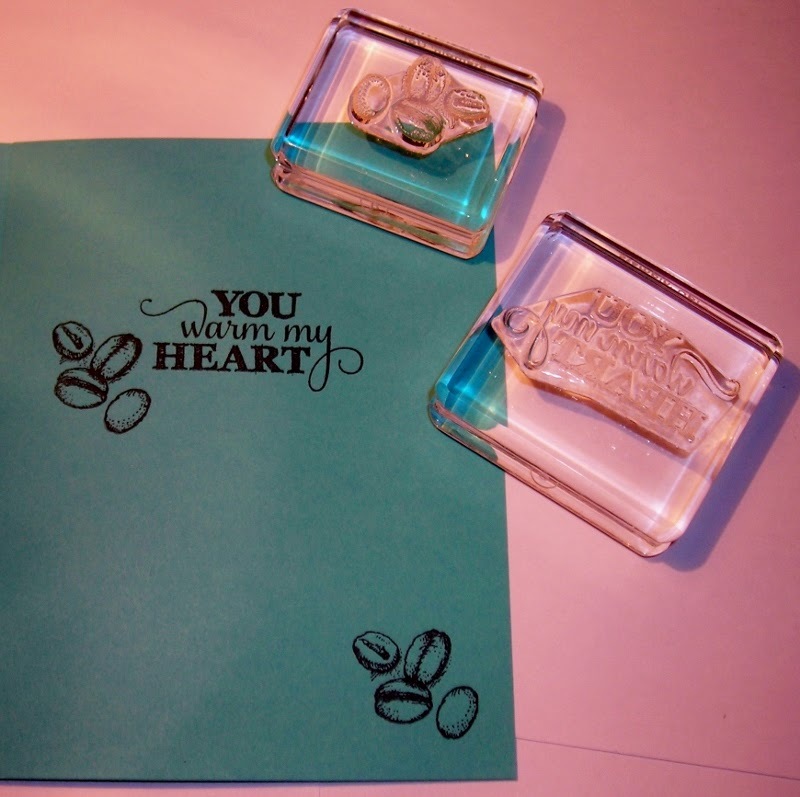 Stamp your sentiment on the inside of your Aqua- Card Base. 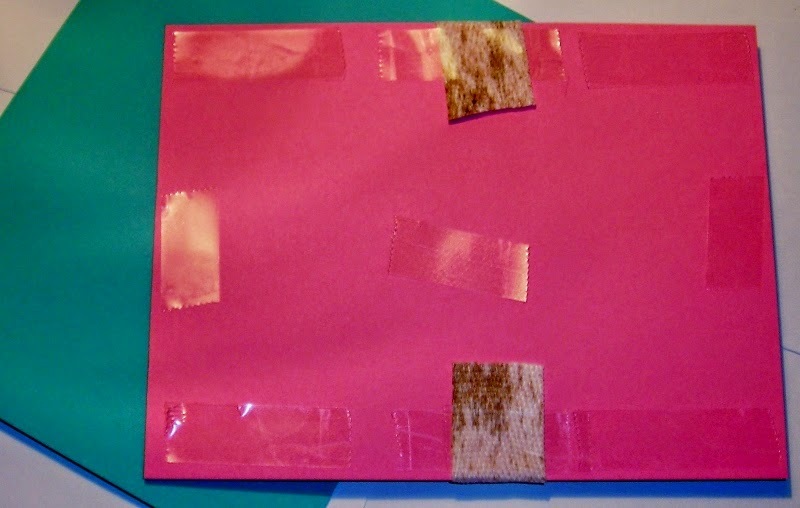 Adhere the Brown- 4" x 5 1/4" card stock on top of the Pink- 4 1/8" x 5 3/8" card stock. 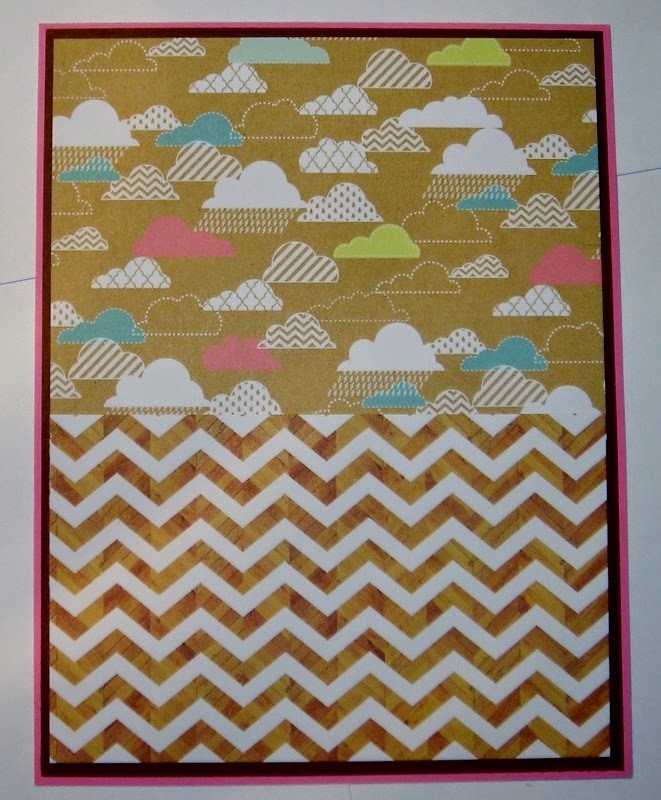 Now adhere the Designer Paper- with Clouds- the 3 7/8" x 2 3/4" card stock to the top. 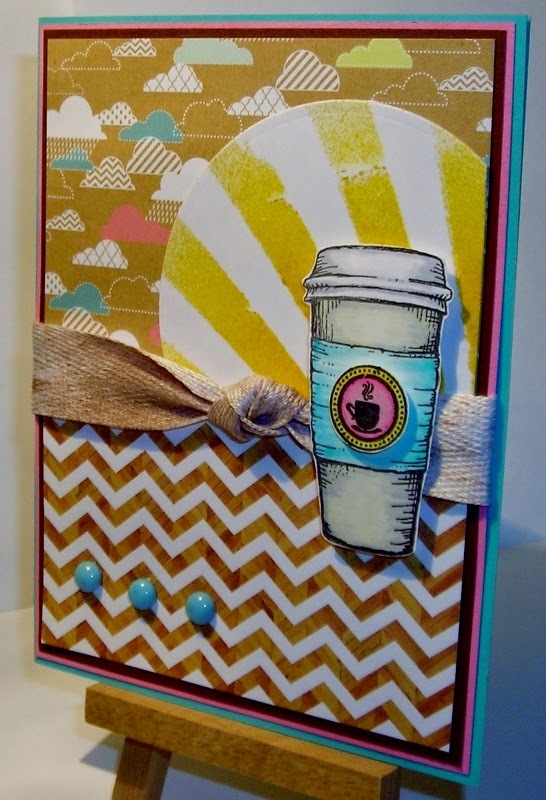 Next adhere the Chevron Designer Paper- 3 7/8" x 2 3/8" card stock to the bottom. 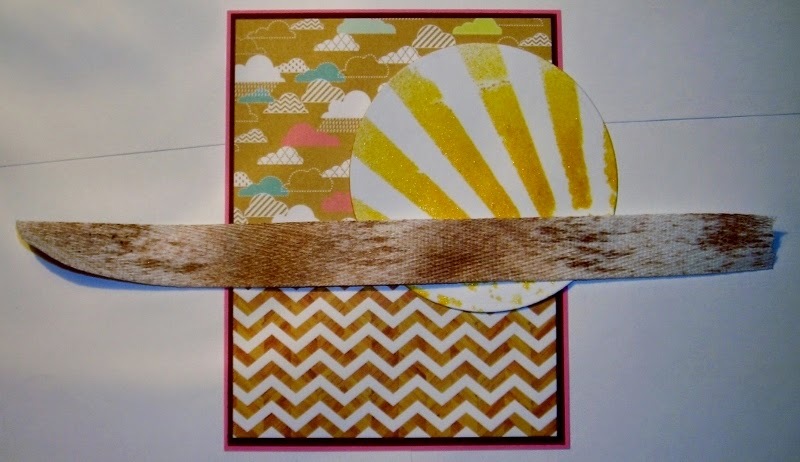 Get an eye for how you want your sun rays to lay. You'll want them going up & out. 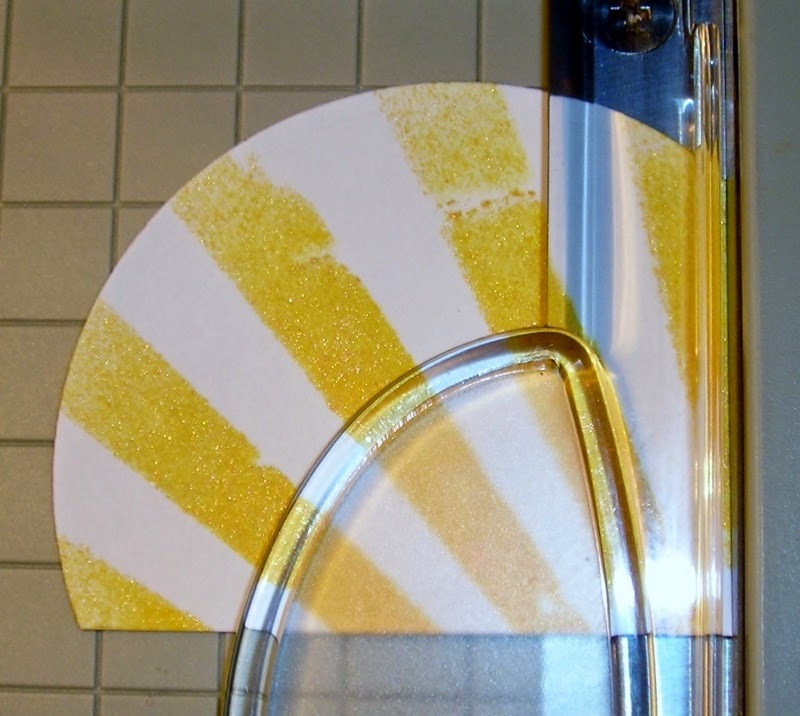 You can use the seam where the two Designer Papers meet to guide you. 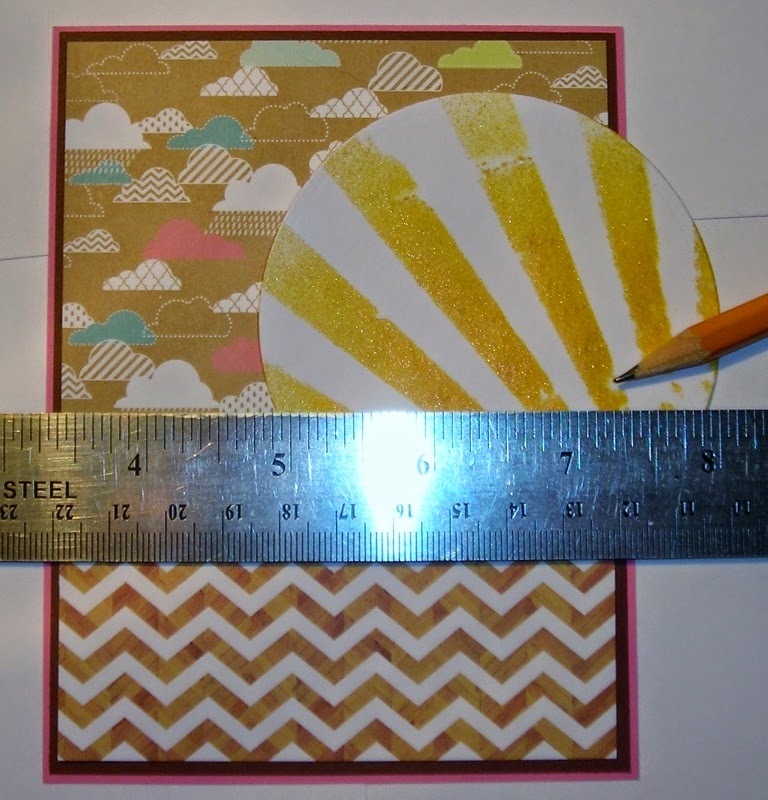 Using a ruler, mark a straight line with your pencil across the circle. 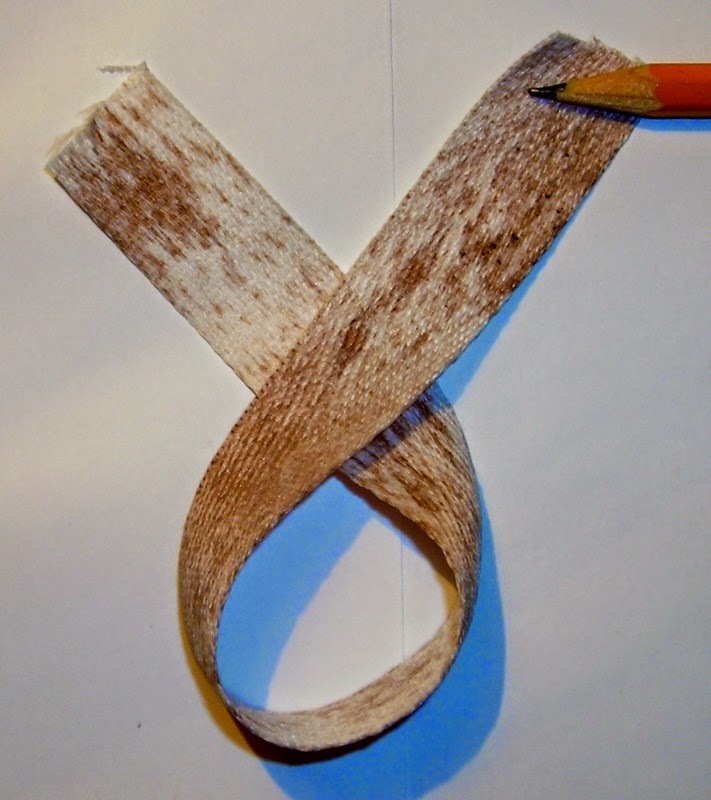 Cut on your pencil line. Now it's time to mark the side of your circle die. 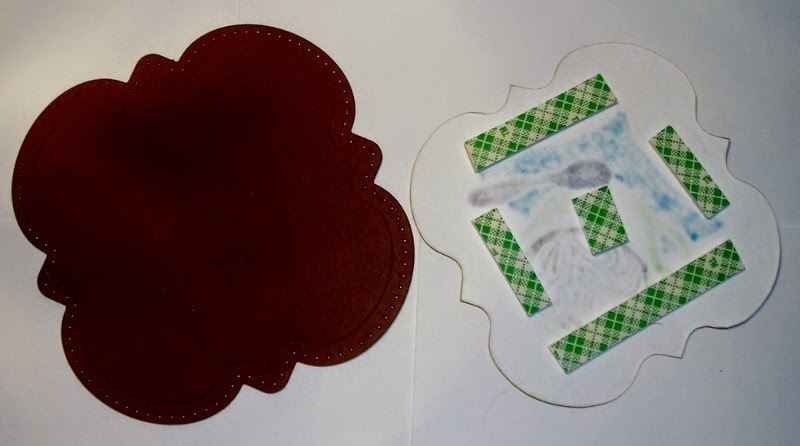 You'll want the matting on the card base to show, so line up your circle to the bottom seam where you just cut, & make your line according to the matting on the side--the brown & the pink. 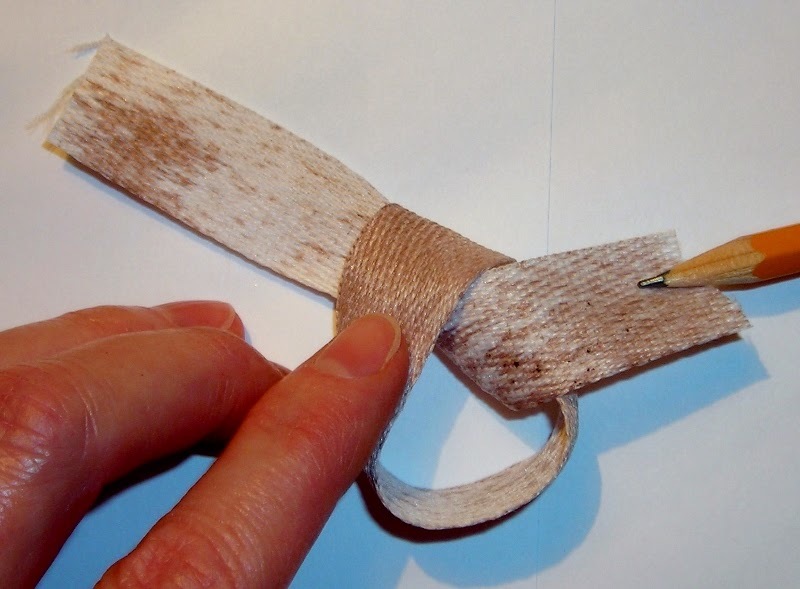 Erase any pencil lines gently with your eraser after cutting. 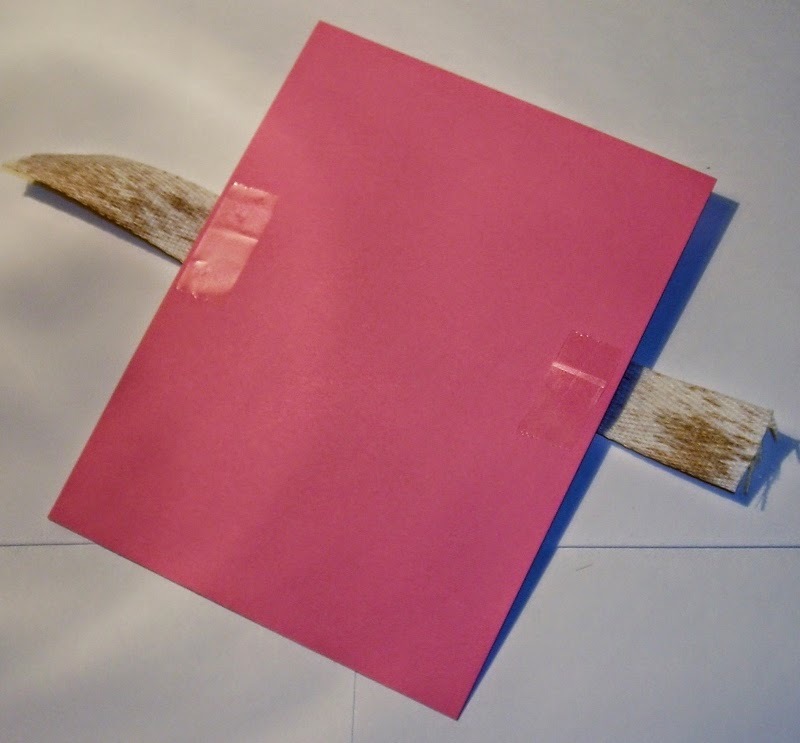 TIP: A "Knead Eraser" works best for erasing without tearing your paper! The one eraser an Artist should have in their arsenal! Here's what you'll end up with. Go ahead & adhere that to the front of your card. Bring the right end down & up through the hole. You can pull to make the knot from here. Pulling gently & twisting to make the darker side show on the front. We want the pointed side of the knot on the front of the card. 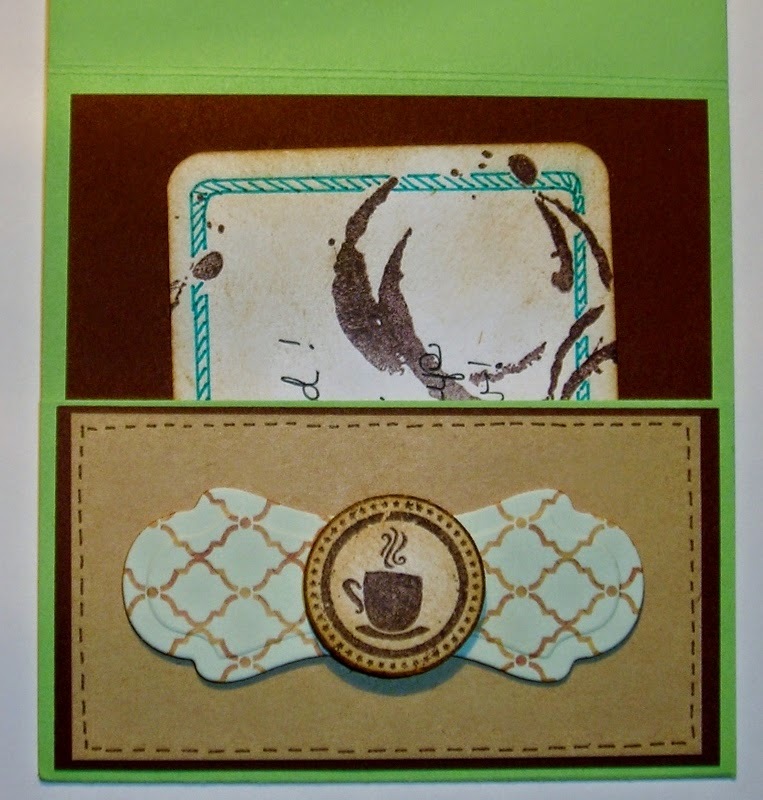 *** See the picture above where the ribbon is laid across the card front. 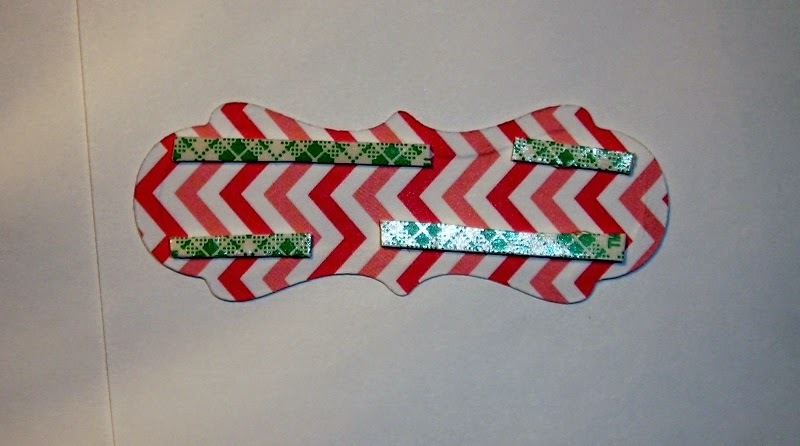 Add adhesive to the back where the ribbon will meet. TIP: This is a way of saving on ribbon too! 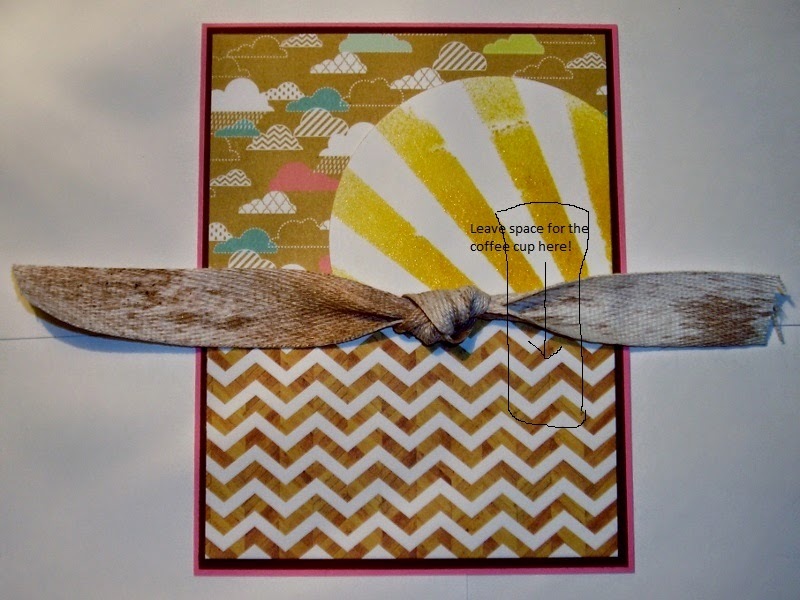 Rather than wrapping your whole card with ribbon. 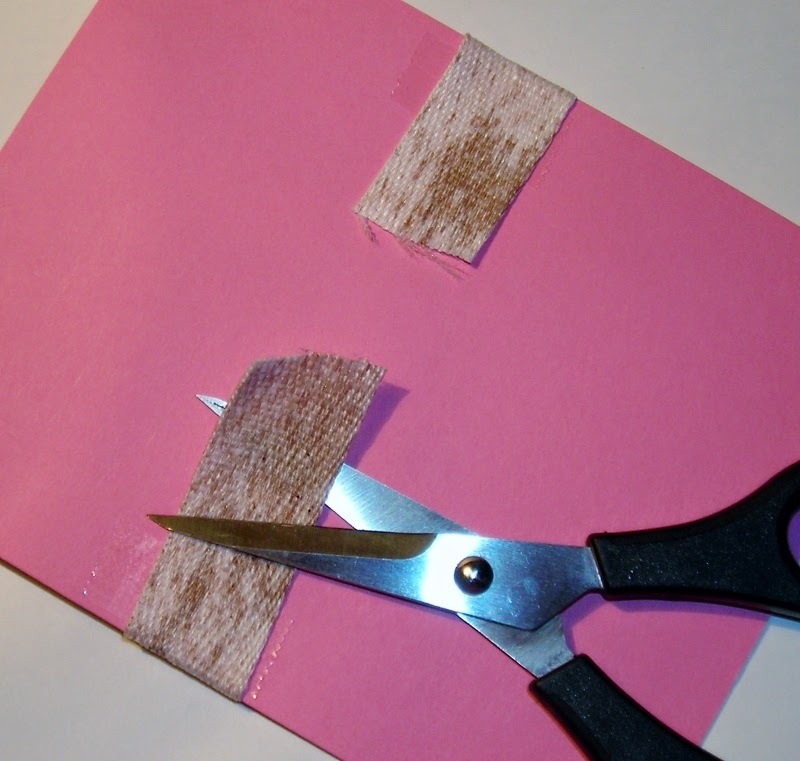 Snip off the excess or add more adhesive. Add adhesive to the rest of the back & yes, on top of the ribbon also. You don't want that ribbon to come loose. 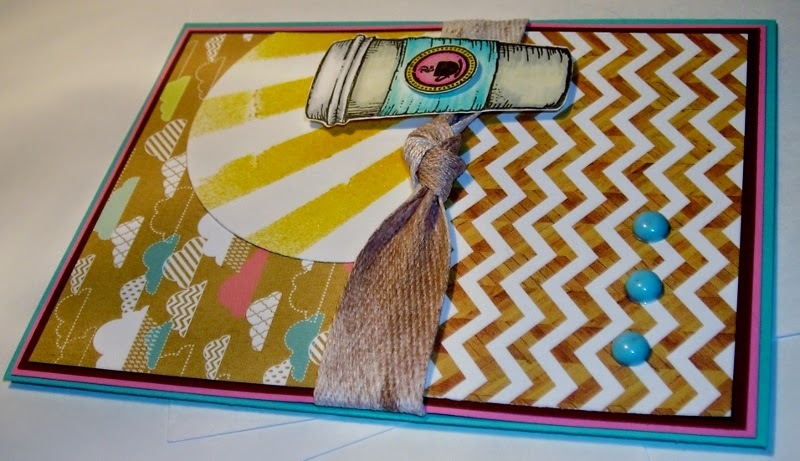 Layer this on top of the Card Base--the Aqua base. Time to stamp your image/s. Color your image/s. I used Copics & Prisma Color Markers. Fussy cut your images to get a close cut on your images. Add dimensionals to your images as below. 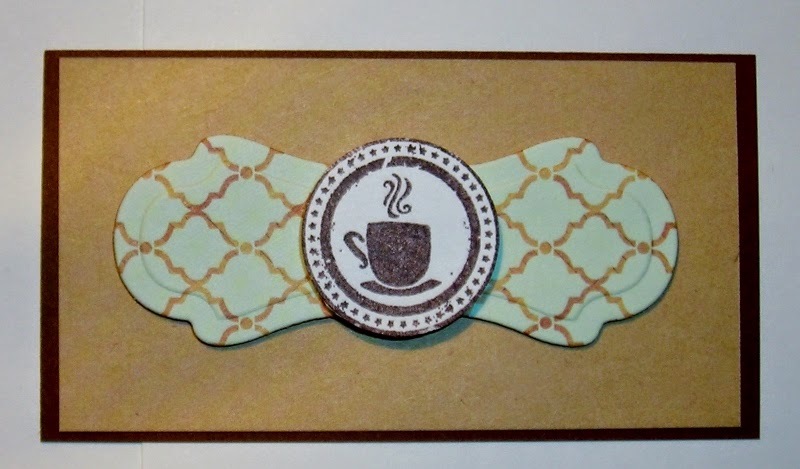 I doubled layered my dimensionals on either end of the coffee cup, so your image won't look puffy in the middle from the ribbon underneath, when it is placed on the card. 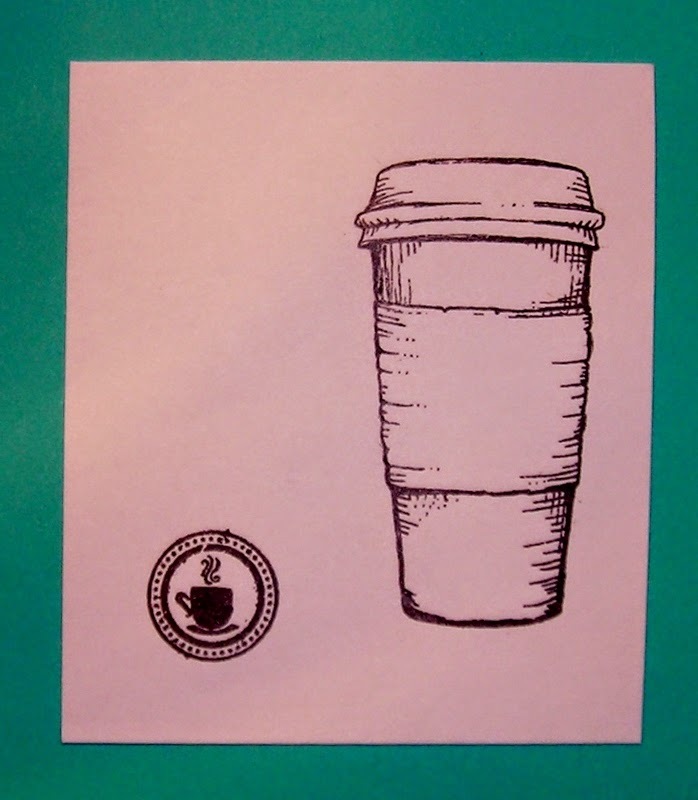 Add the little circle coffee cup image to the front of the main image. Adhere your main image, straddling the ribbon with your main image. Now add the 3- Enamel Dots. 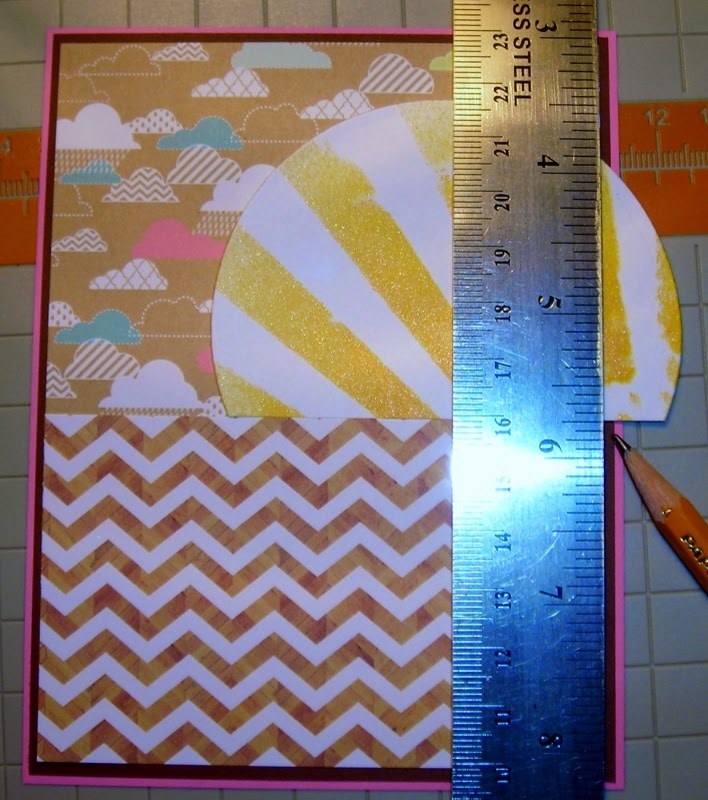 To get them straight, just line them up with the chevron pattern. Hope you've enjoyed my "Tutorial Blitz!" Let me know if you liked my "Tutorial Blitz--Behind the Scene's?" I hope you will like what I'll be doing! TUTORIAL BLITZ----Behind the Scenes- #2! & the second of my tutorials! a little pocket for a Gift Card! 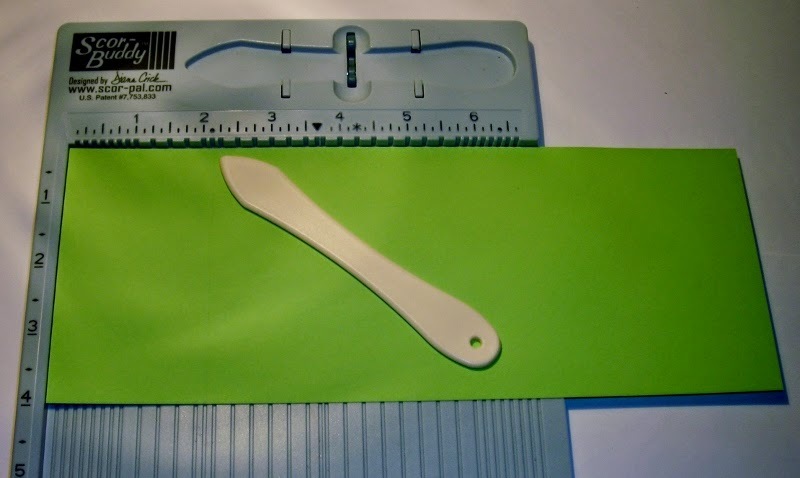 1- Green Card stock- 10 1/8" x 3 7/8" -Card Base. 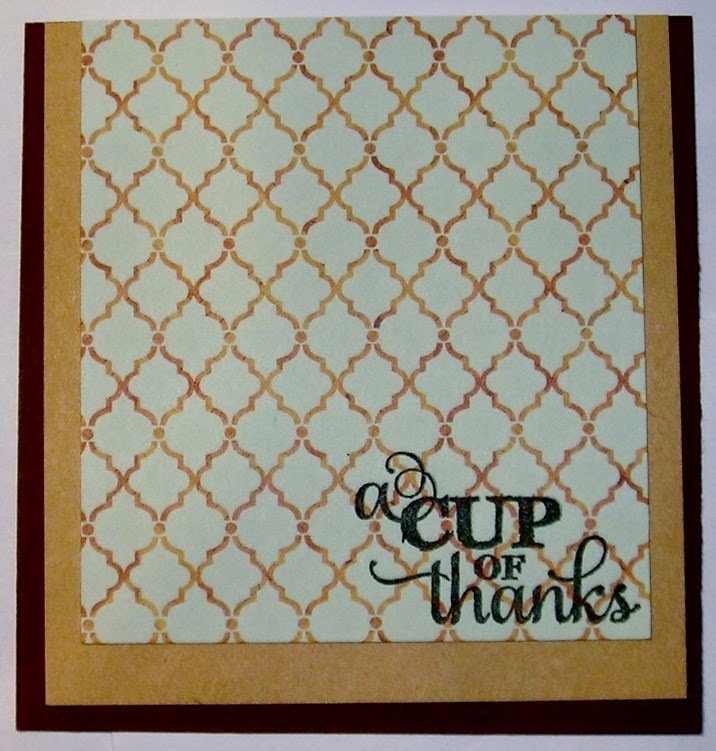 1-Brown Card stock- 3 5/8" x 3 7/8" -For the front of your card. 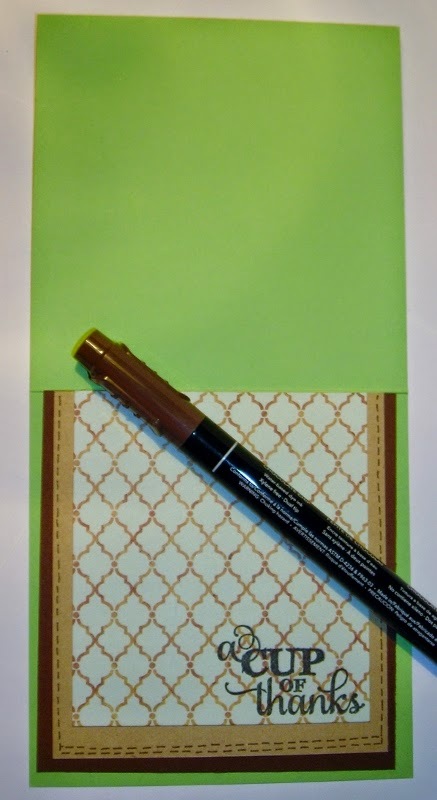 1- Brown Card stock- 3 3/4" x 3 5/8" -For inside of your card. 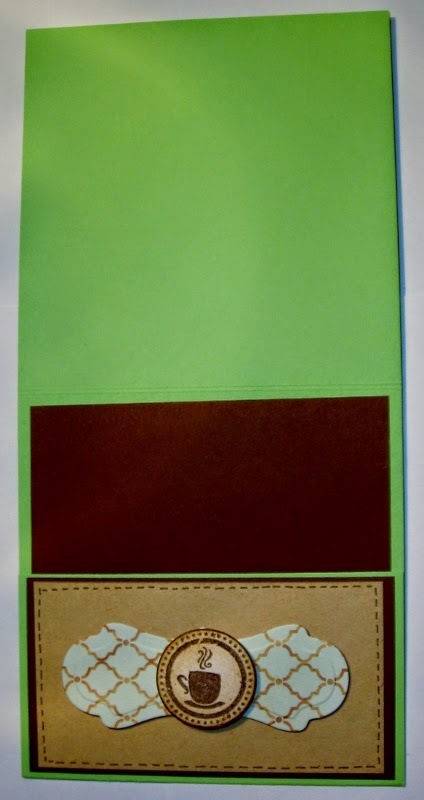 1 -Brown Card stock- 3 3/4" x 2" -For the front of the pocket. 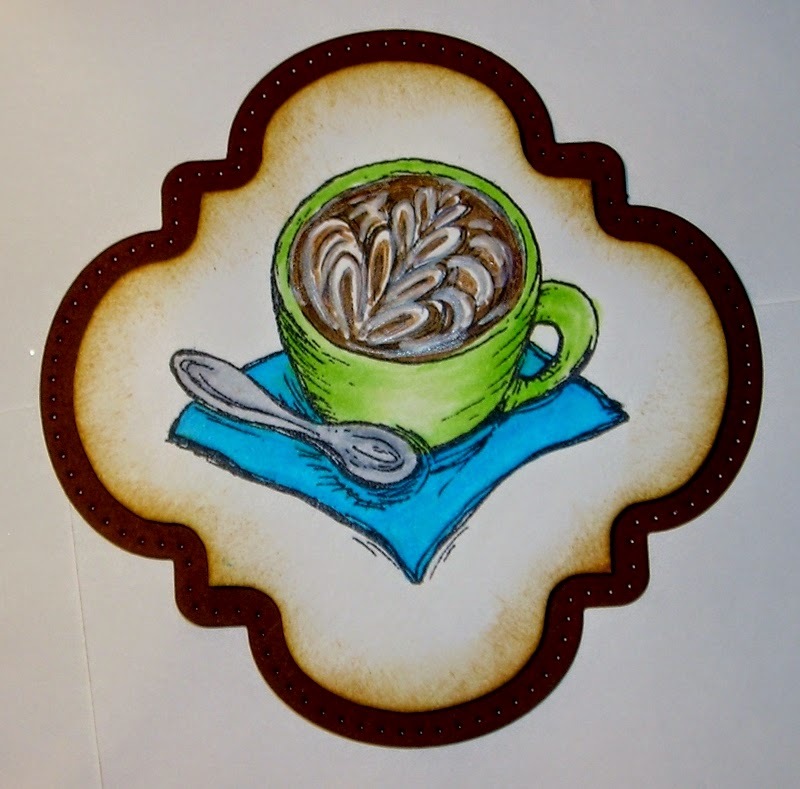 1- Large Die Cut in Brown- This is for the matting for the card topper. 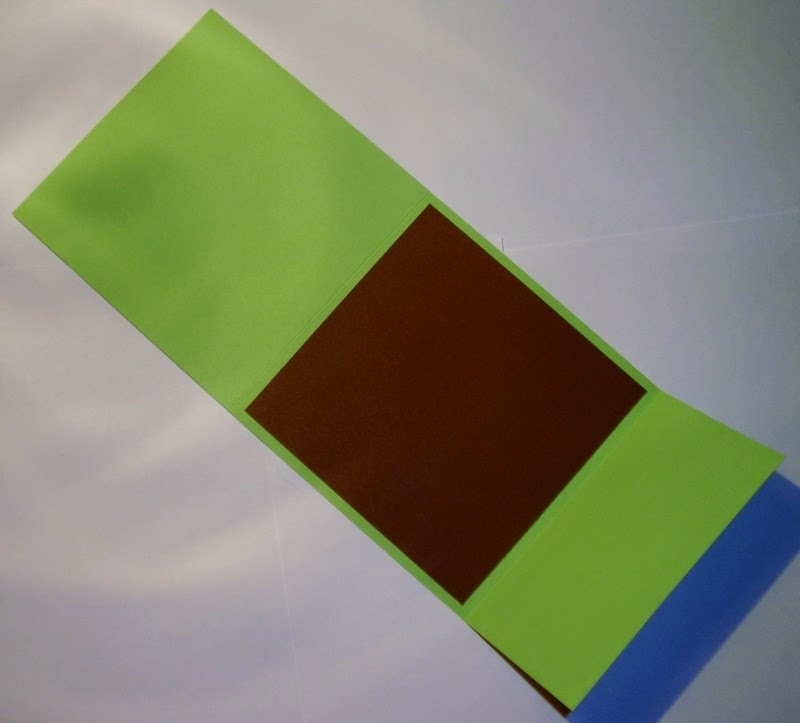 1-Tan Card stock-3 3/8" x 3 3/4"- For the front, matting on top of the Brown-3 7/8" x 3 5/8". 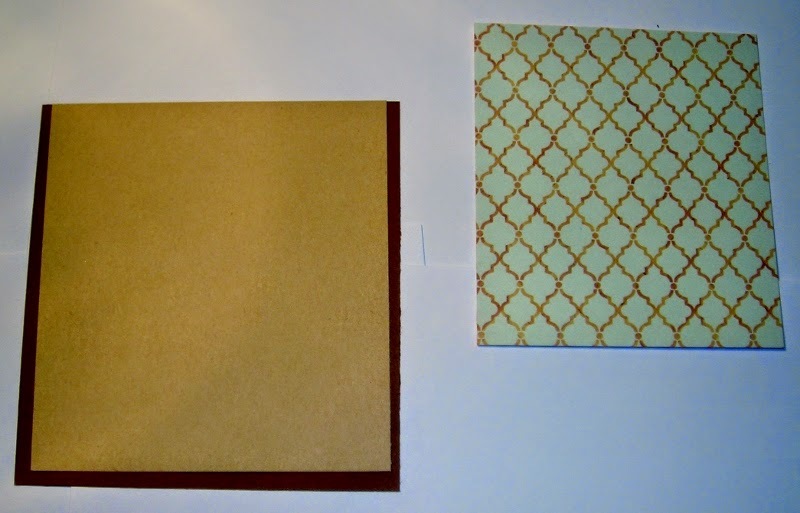 1- Tan Card stock- 3 1/2" x 1 7/8" -For the pocket, matting on top of the Brown-3 3/4" x 2". 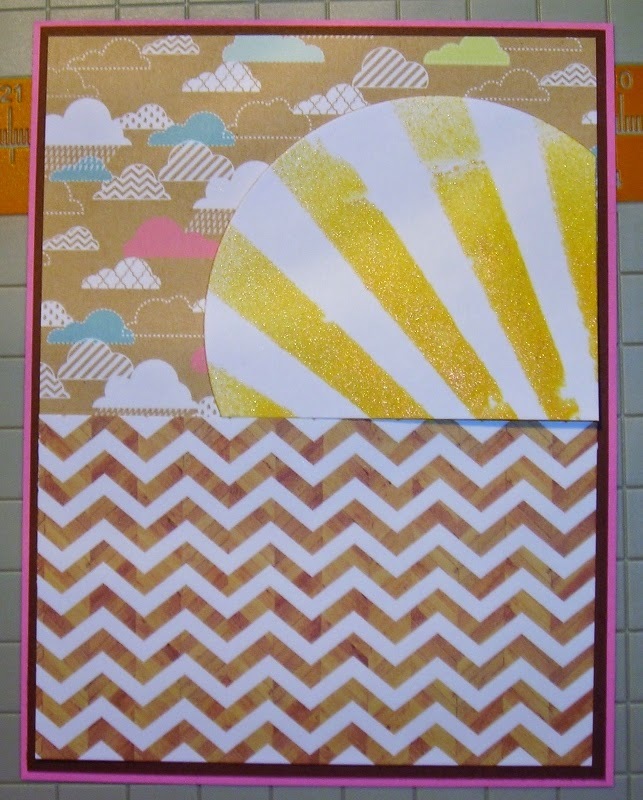 1-Print Designer Paper- 3" x 3 3/8" -For the front, matting it on top of the Tan- 3 3/8" x 3 3/4" . 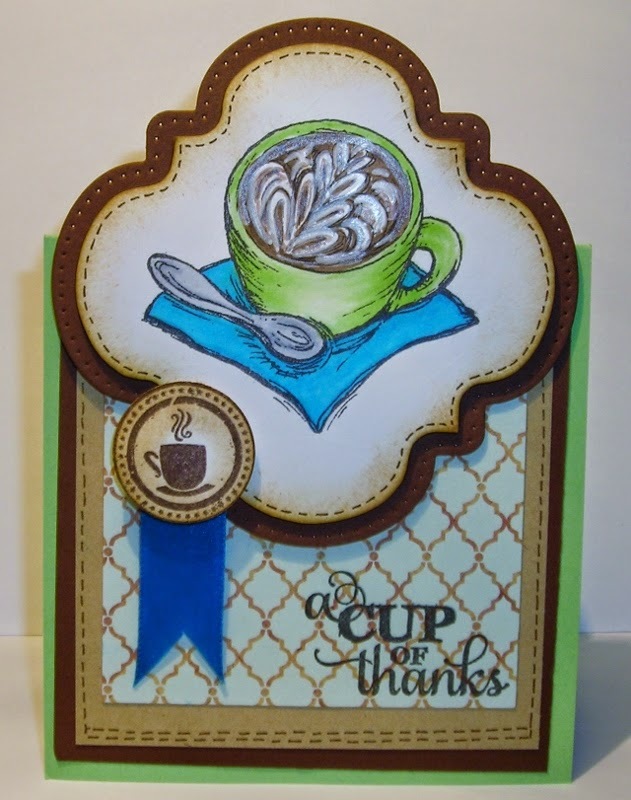 1- Small Fancy Die Cut in Designer Paper- For the front of the pocket, inside your card. 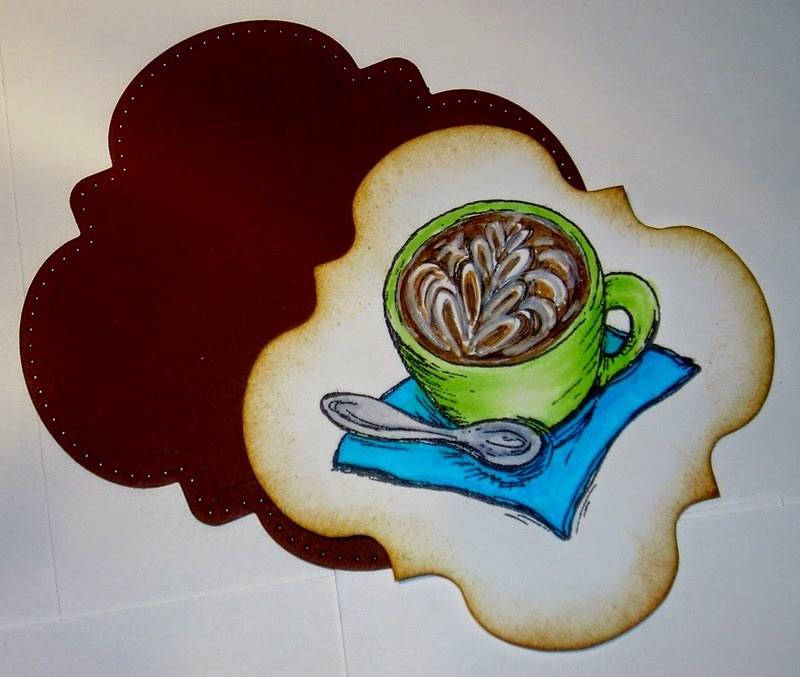 1- Large White Die Cut- For the front image to be stamped on. 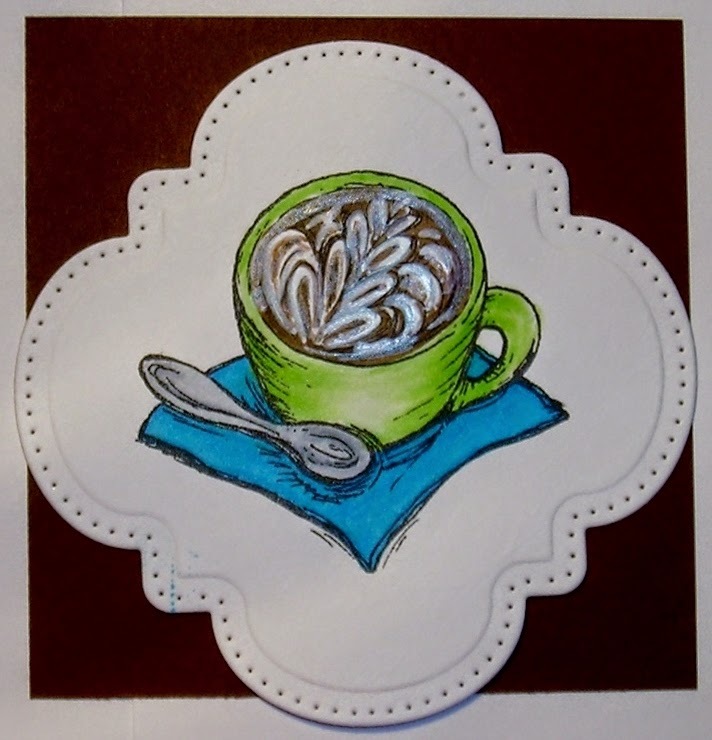 1- White Card stock- 3 3/4" x 2" for stamping a coffee cup circular image. 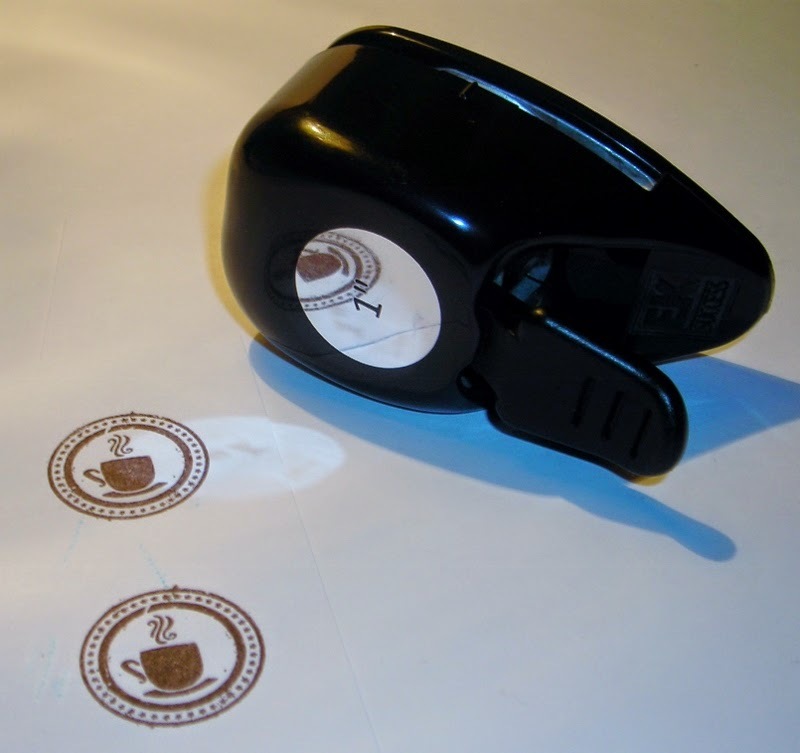 Which can be found most anywhere in the stamping market. 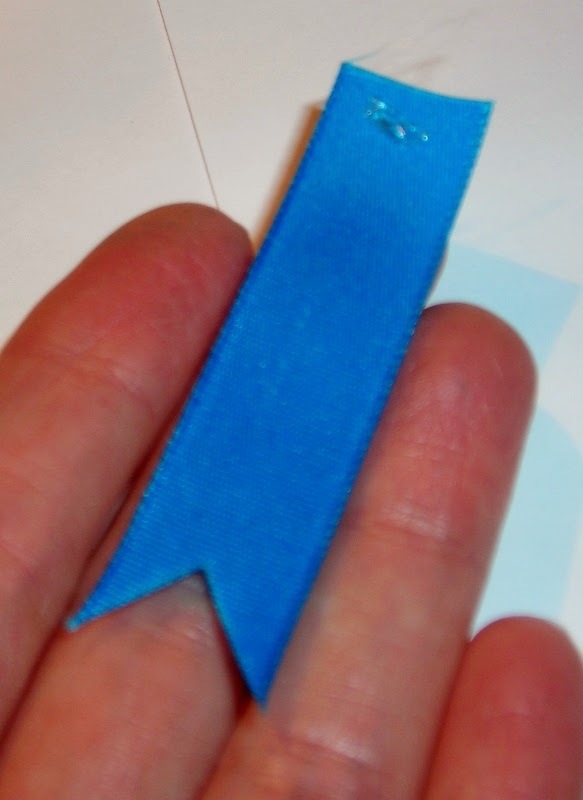 1- 2 1/2" Turquoise Ribbon- 5/8" wide, or color your own. 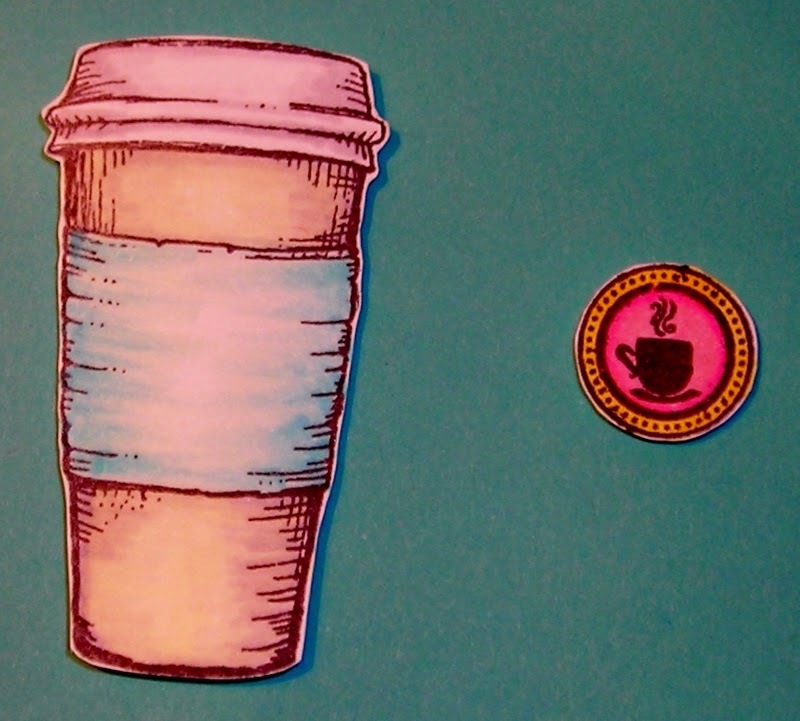 Coffee Cup Image, a 1" Circular Coffee Image, & a smaller Circular Coffee Image. & a Faber-Castell Pitt-White Pen. You choose. 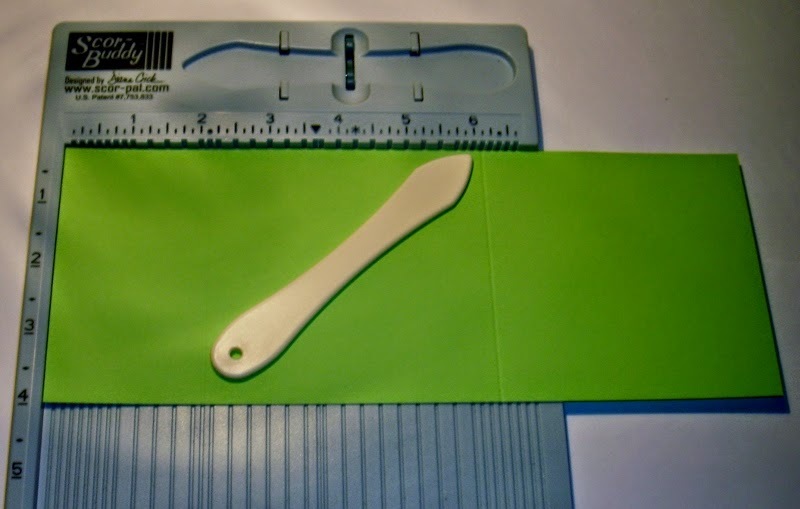 To begin with, start with the 1- Green 10 1/8" x 3 7/8" Card Base. Lay across your Score-buddy, horizontally. 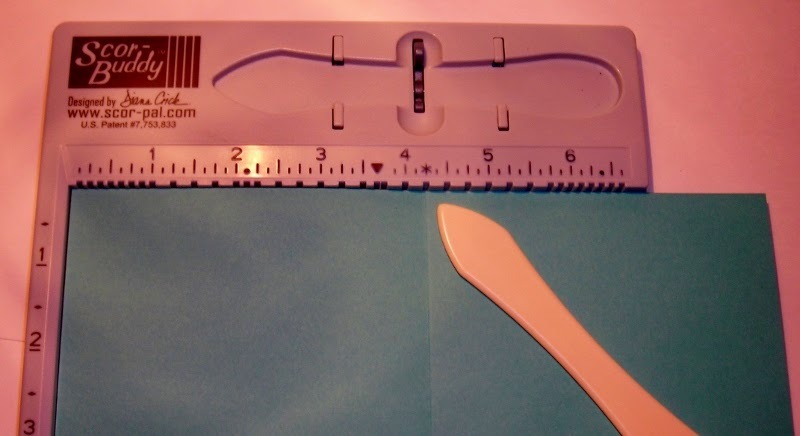 Score your card stock at 2 1/8". Leaving your card stock on the Score-buddy, score at 6 1/8"
Time to stamp your image. Notice the placement of the image on the die. Now you can color in your image with the medium of your choice. 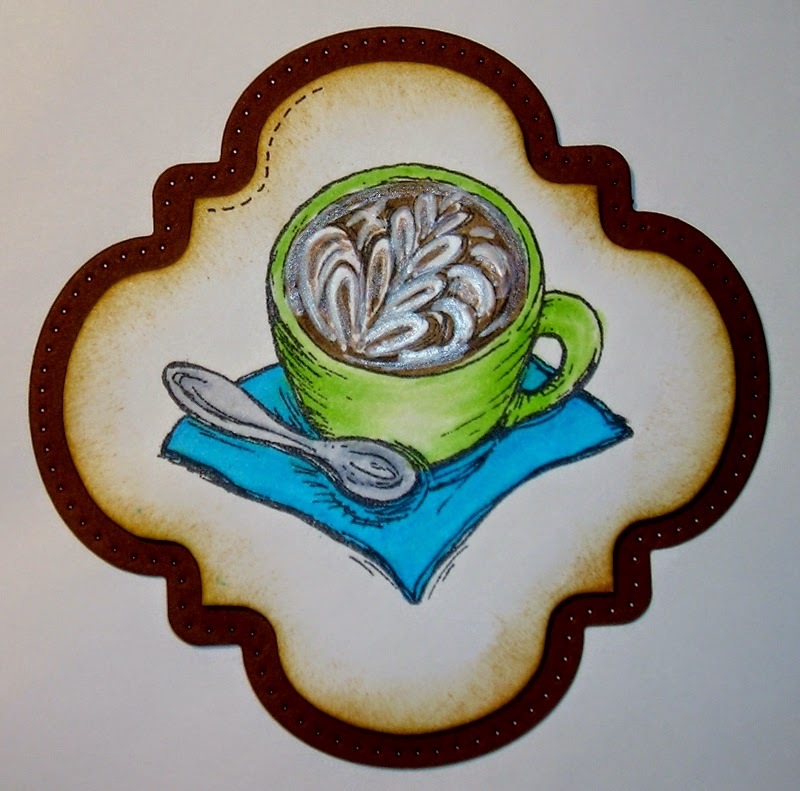 I used Copics, Prisma Color Markers & a Faber-Castell Pitt Artist Pen. 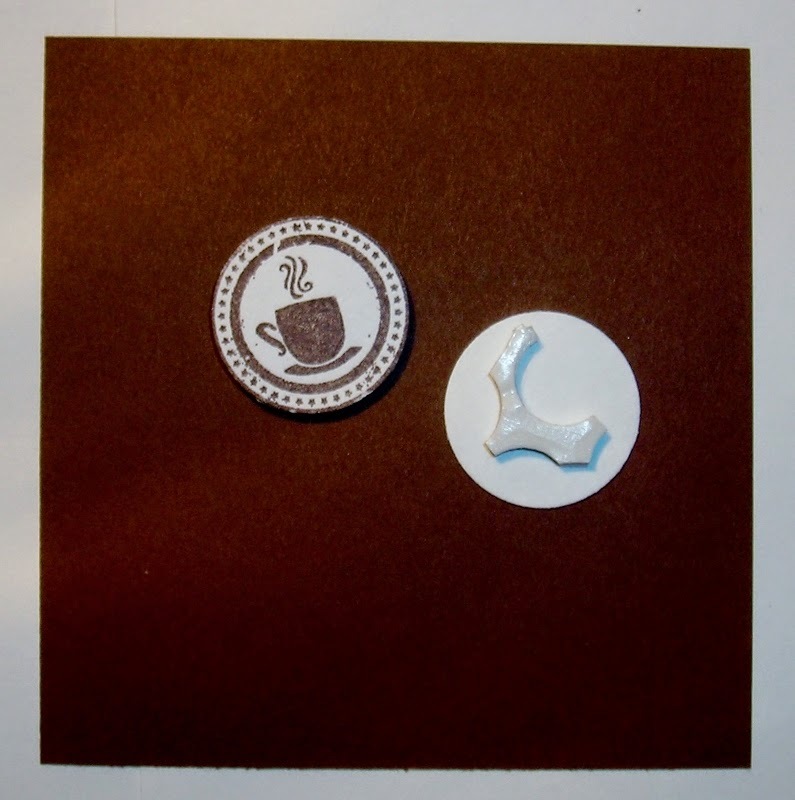 Using your scissors, cut off the pierced area or another way to put it, cut along the embossed edge of the die. This is what you'll end up with. A nice matted image! Set this aside for now. Mat these two pieces, tan on top of the brown. Flip it over & add dimensionals. 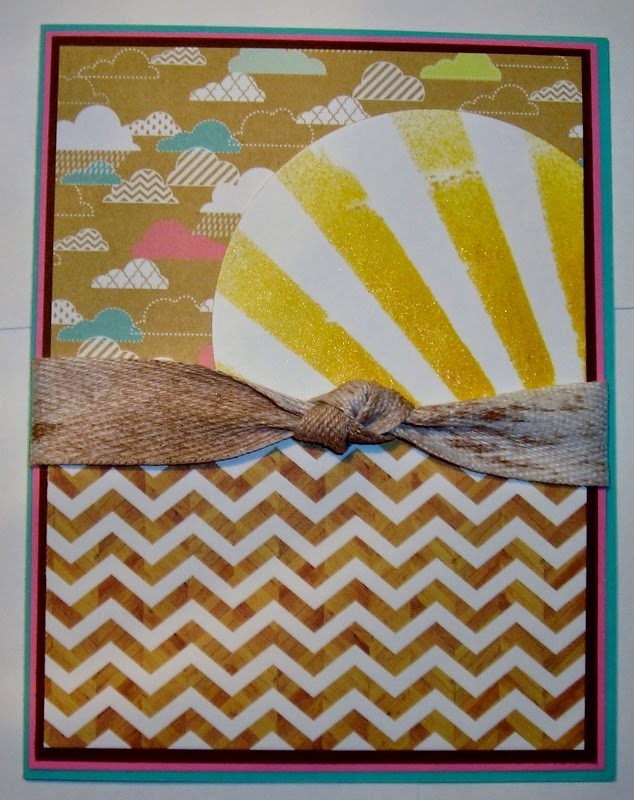 Now add it to the center of the matted Brown & tan card stock. there are plenty of these images out on the market. A SU- 1" Circle Punch worked perfectly to punch this out. 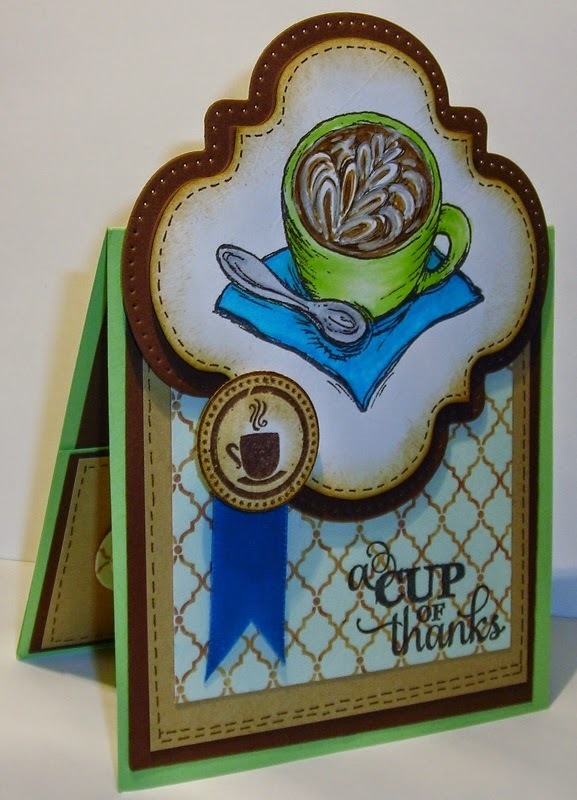 Using a smaller circular coffee cup image, add it to the center of the front of your pocket piece you just created earlier--the 3 3/4" x 2" Brown base with the tan card stock & the small fancy die on top. the Brown- 3 5/8" x 3 7/8" , the Tan- 3 3/8" x 3 3/4", Designer Paper- 3" x 3 3/8". Now, mat these pieces, starting with the Tan on top of the brown. Take the paper all the way to the top edge. Now, stamp the Designer Paper with your sentiment as below---off to the bottom right. 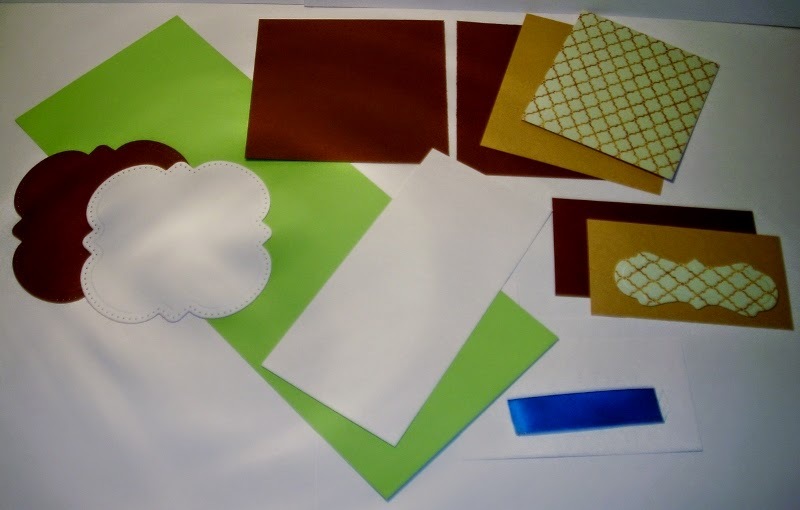 Now, layer this Designer Paper on top of the tan. 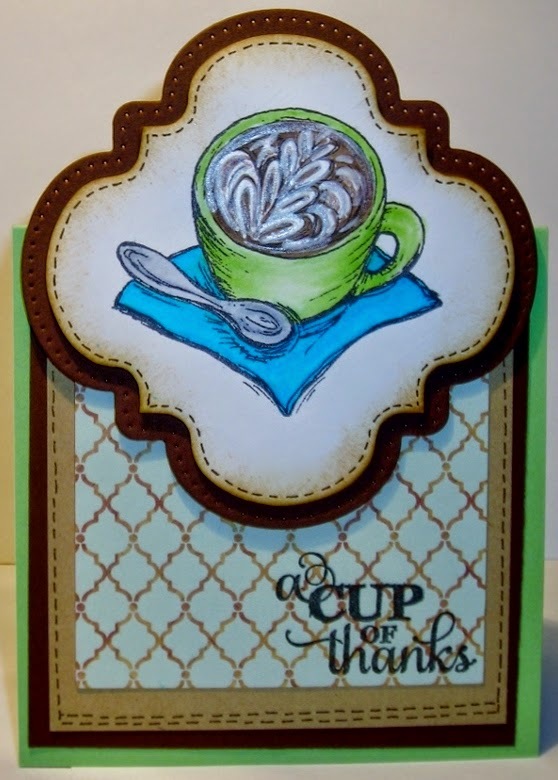 Add your faux stitching on the front of your card as below using your fine tip Dark Brown Marker. 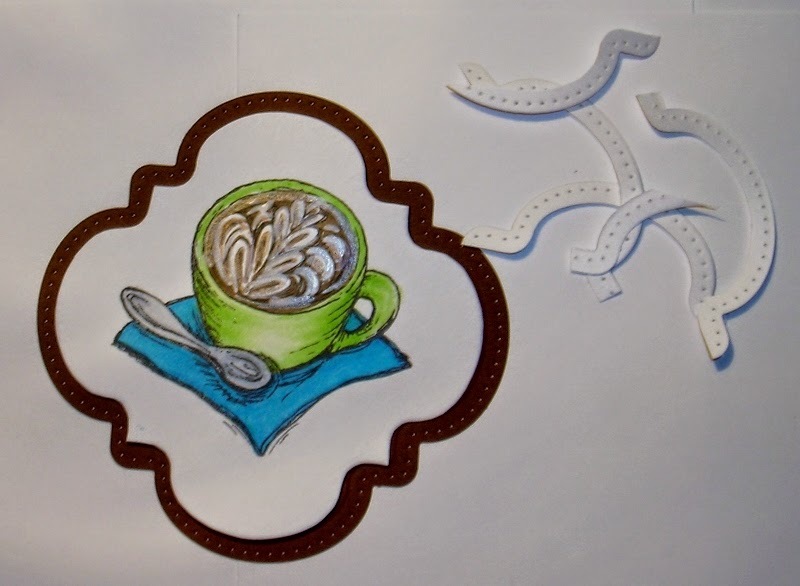 Tip: Follow the outside edge of your paper to draw your faux stitching lines & take your time. Notice: the double line of stitching on the bottom edge. Now go back to the main image you have stamped on the large Die Cut. 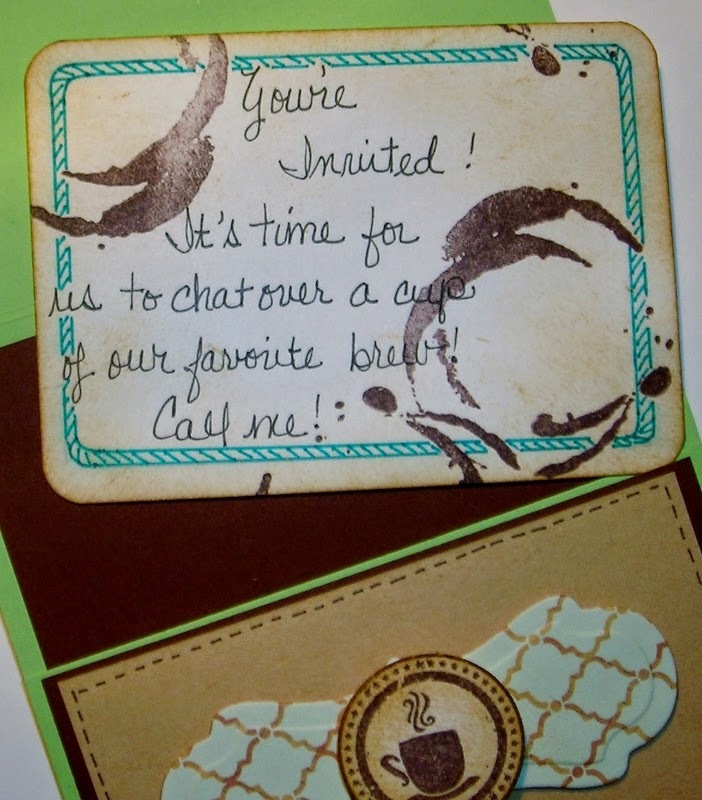 Using a sponge & your Tim Holtz- Distress Ink- Tea Dye, sponge the edges of the main image. Add dimensionals to the back of the main image. 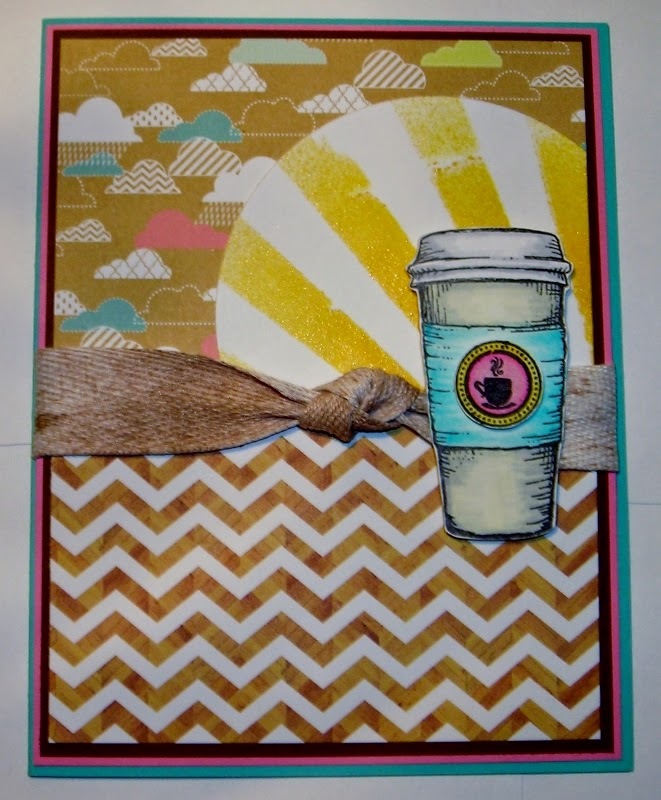 Peel off the backing of the dimensionals and add your main image to the large brown die & set this aside for now. 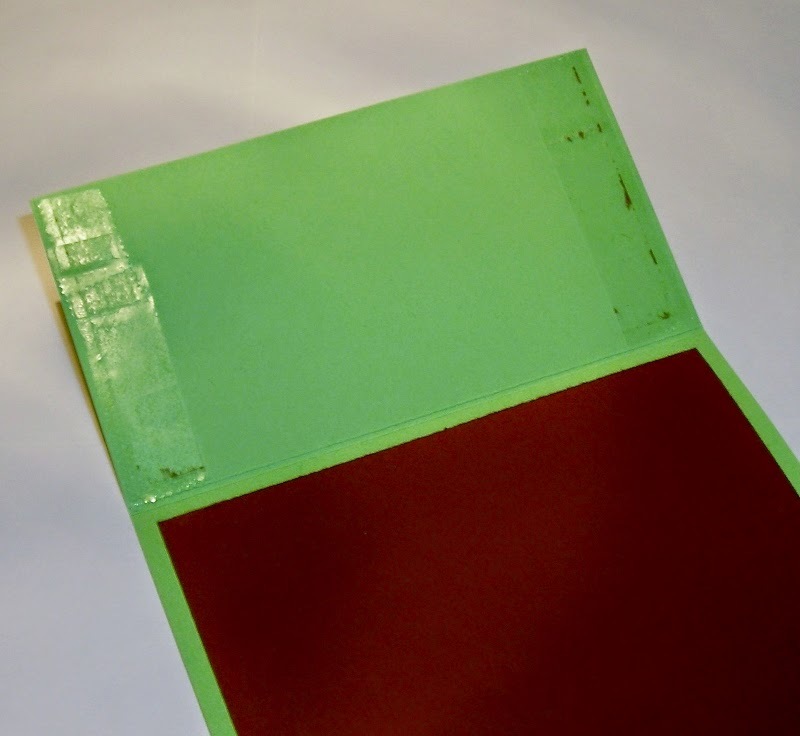 Open up the Green- Card base, 10 1/8" x 3 7/8". 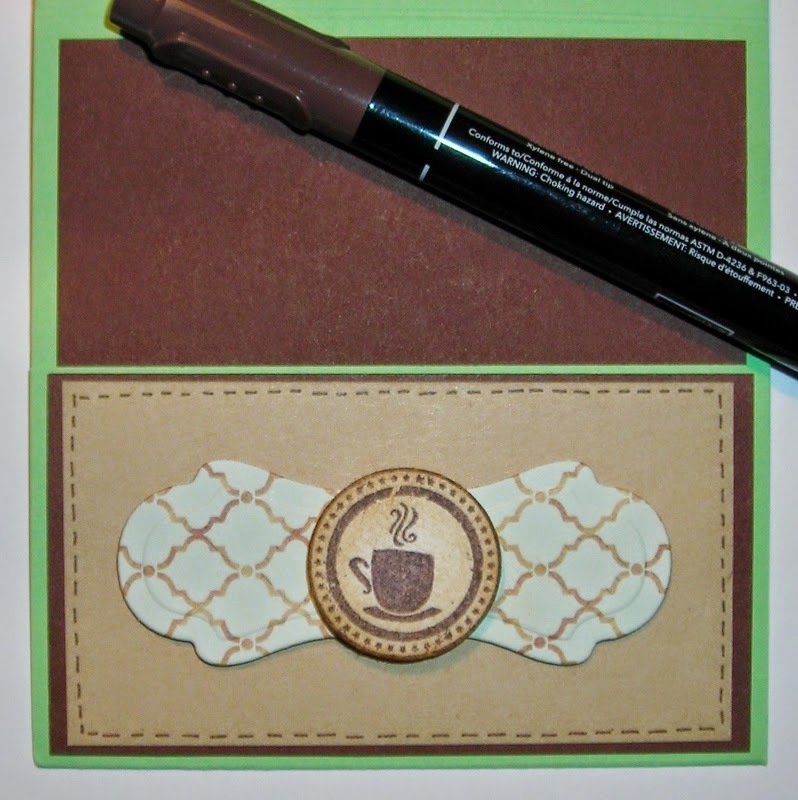 Add adhesive to the Brown card stock- 3 3/4" x 3 5/8" piece & place in the inside of your card. 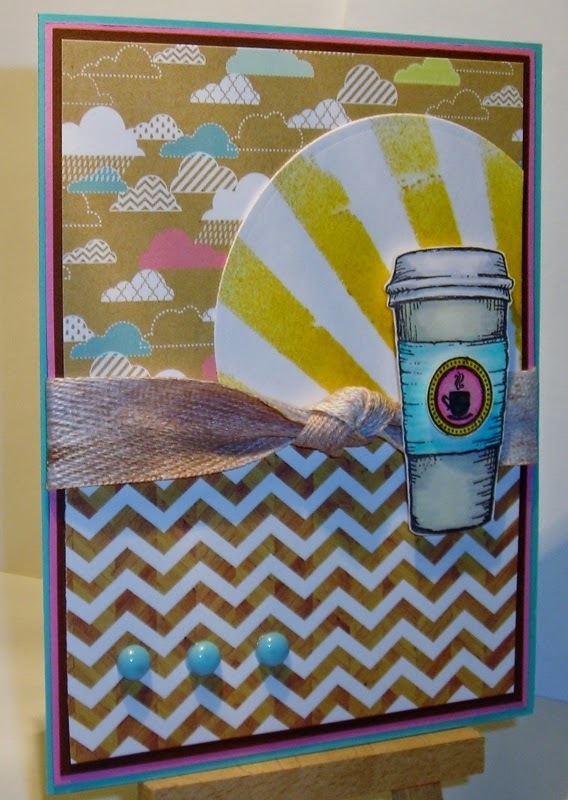 TIP: Most any card can be turned into a "Gift Card Holder," by adding a pocket! 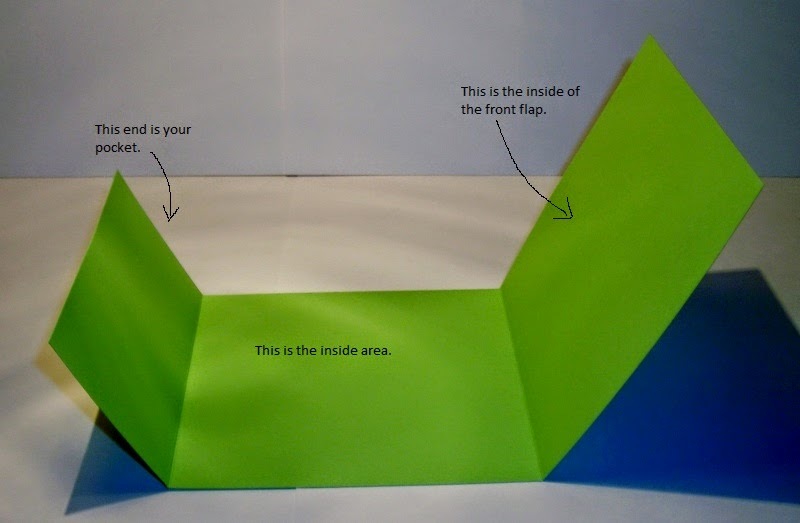 Now flip your little pocket up & adhere. 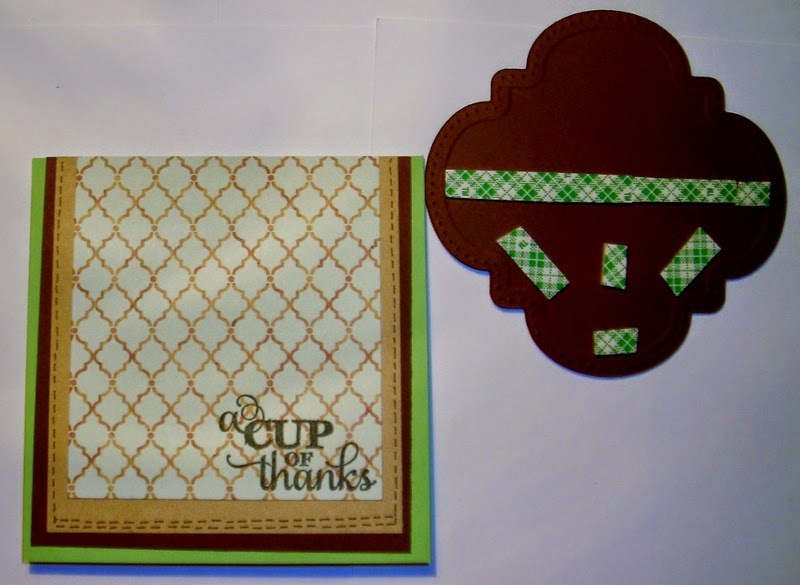 Using a fine point Dark Brown Marker add faux stitching on the inside of your card, on the edges of the tan card stock. (Sometimes, you don't see you need certain things till you've almost got the pieces together & then you have to find ways to add what is needed! That is what I've done here. 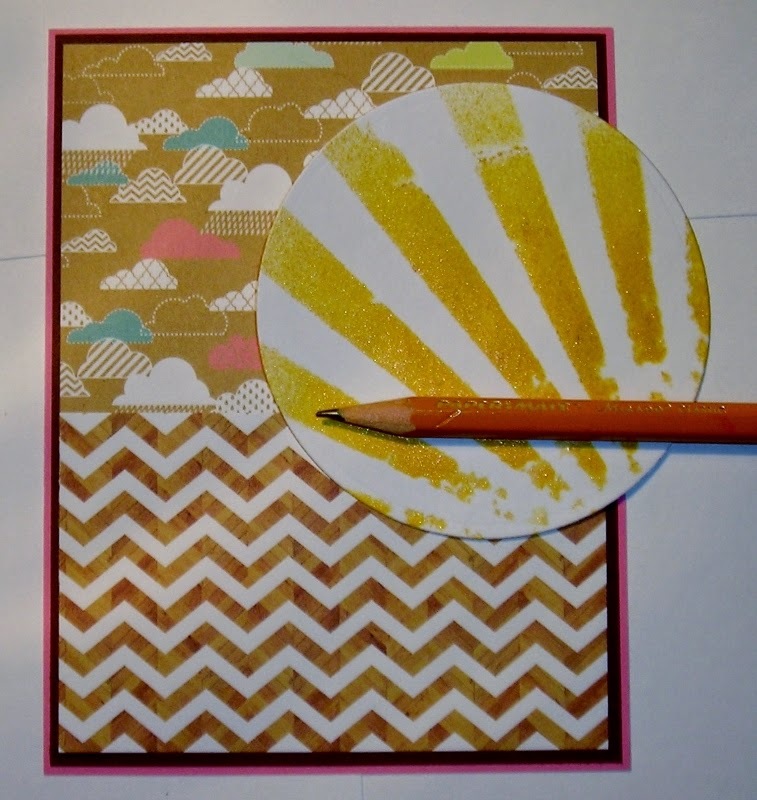 With the dimensionals on the back it will feel a little unsteady to be drawing on, so use your finger to press the edge of the paper down as you draw, this will help to steady it. Now add dimensionals to the bottom half on the back, of your main image, as below. Peel the backing off of your dimensionals & flip your die over. With your card base closed, attach to the card base. Making sure it is centered. 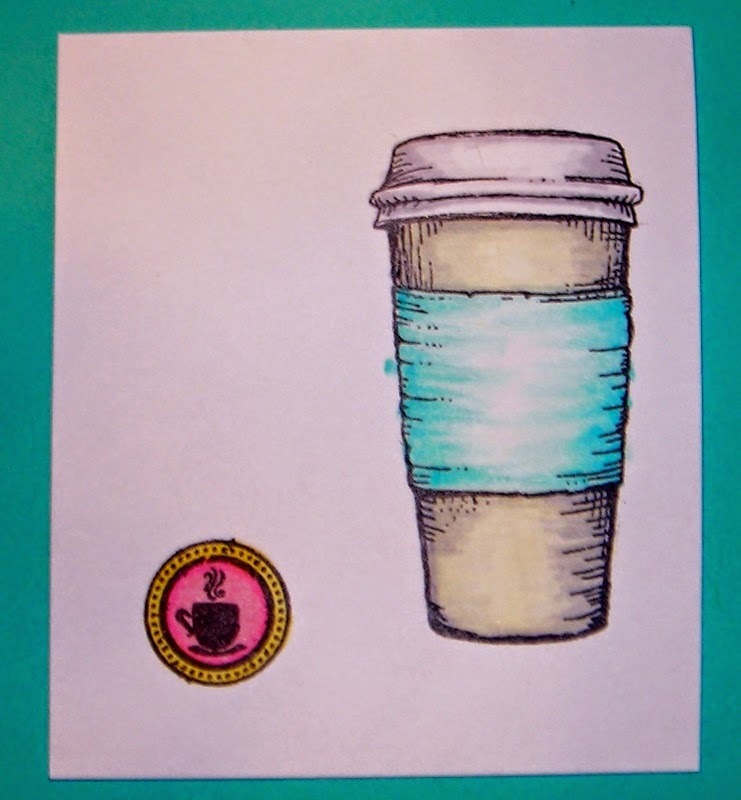 Attach the ribbon to the card, & then attach the large circular coffee cup image, with the dimensionals on the back over the ribbon as below. You have now completed your Blue Ribbon Thank You Gift Card! I also came up with an idea that you can do if you can't access a coffee shop. 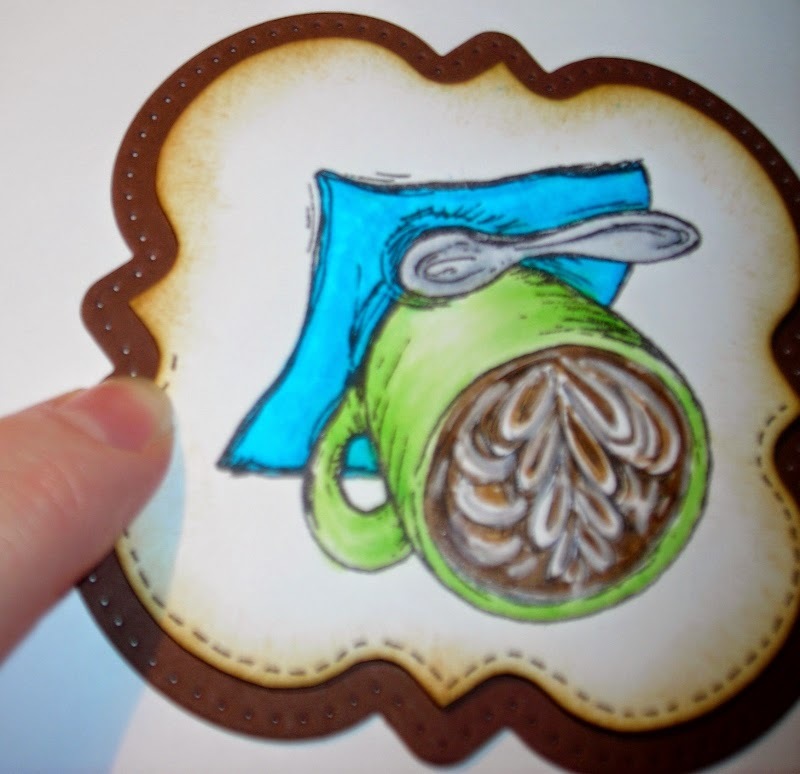 We don't have any Specialty Coffee Shoppes here, where I live, so I thought if you too are in the same situation or if you just don't have that extra money for a gift card, you can make your own gift card. 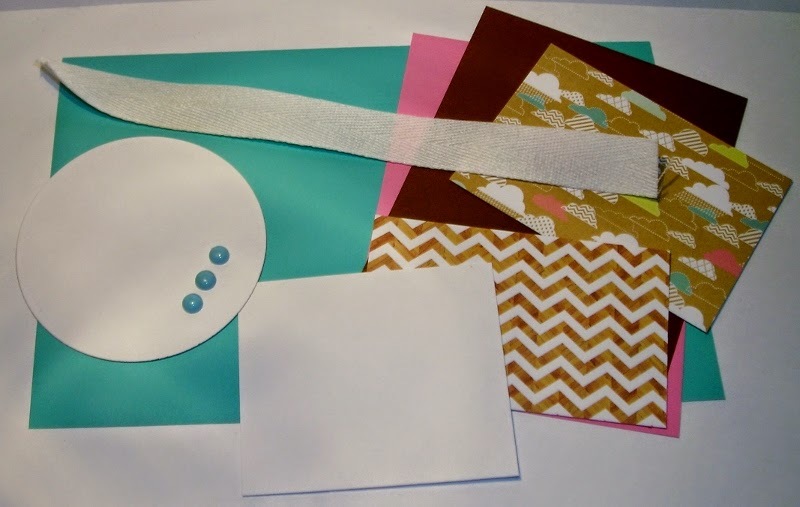 (using a SU- Corner Rounder Punch) to create a gift card. 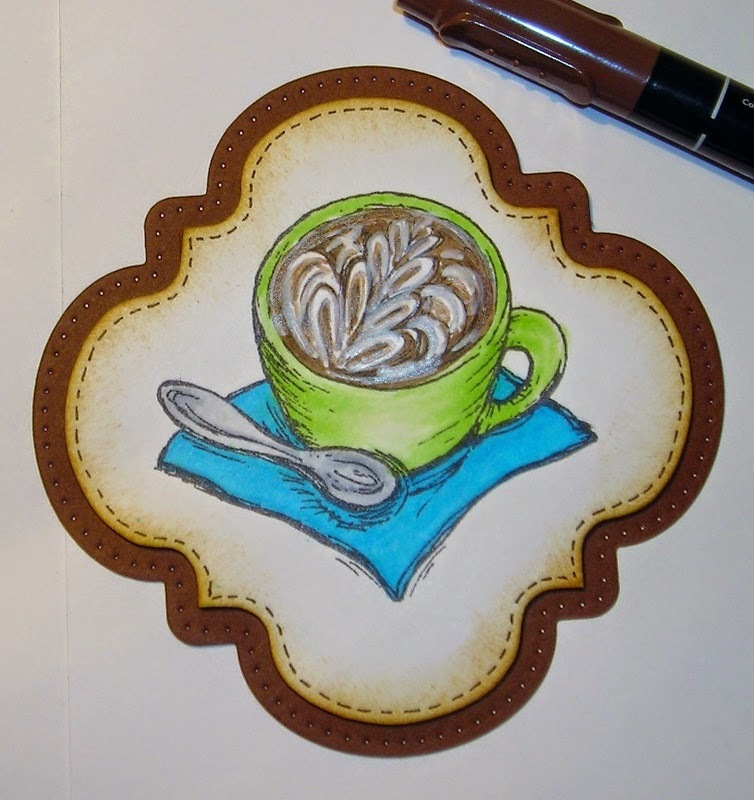 Here is my hand-written note, drawing my own boarder & also sponging Tea Dye Ink on the edges & a little right to the front of the gift card itself. 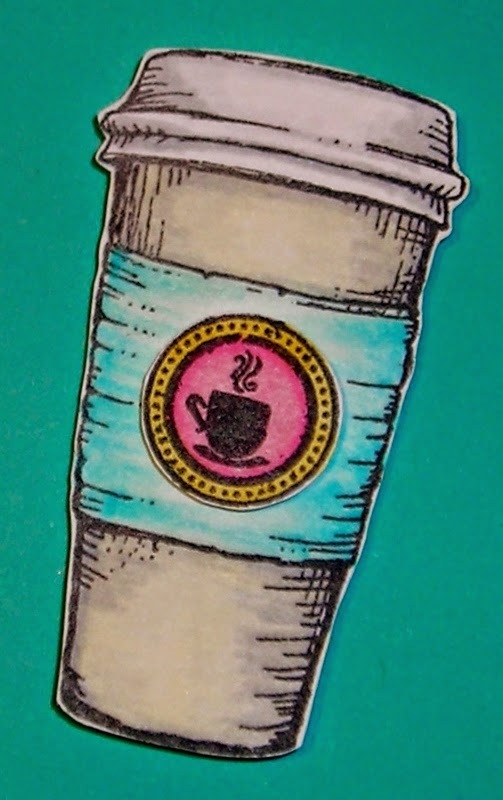 There are many companies that carry a Coffee Stain/Splatter Images now. This is with the gift card inserted into the pocket. STILL CREATING & LOVE'N IT!!!! You'll LOOOOVE these images! 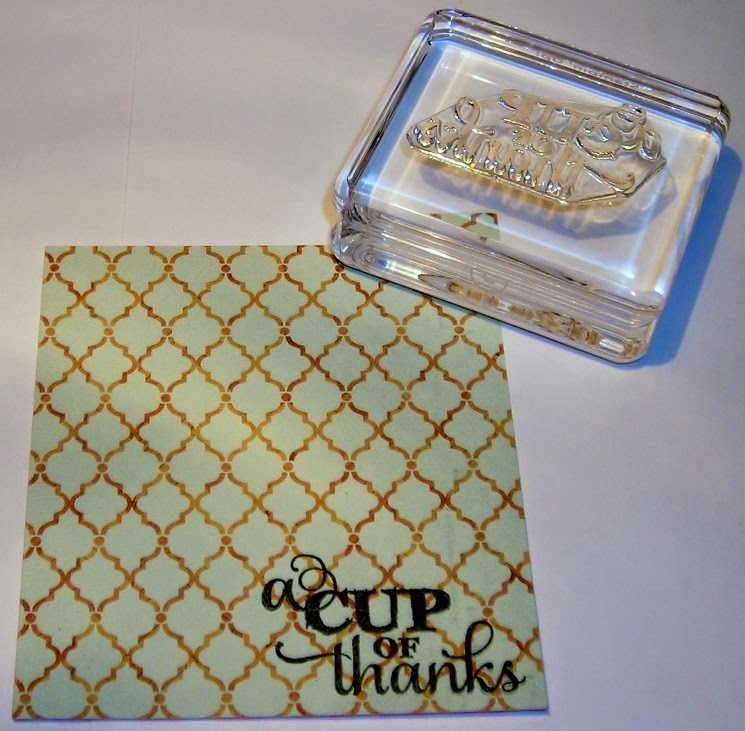 Some of the very first images I purchased when I began stamping! TUTORIAL BLITZ------Behind the Scenes- #1! The Birthday of "THE KING!"